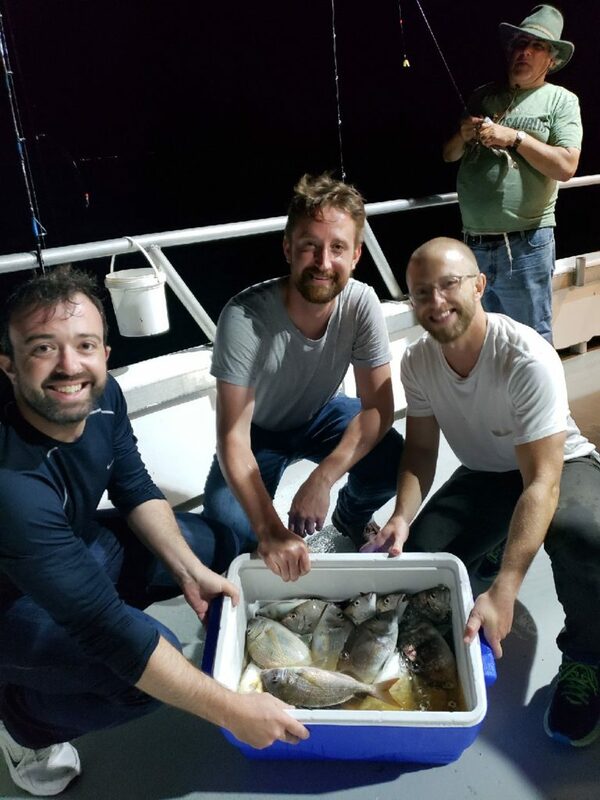 We had great fishing both day and night all weekend for Porgy’s! 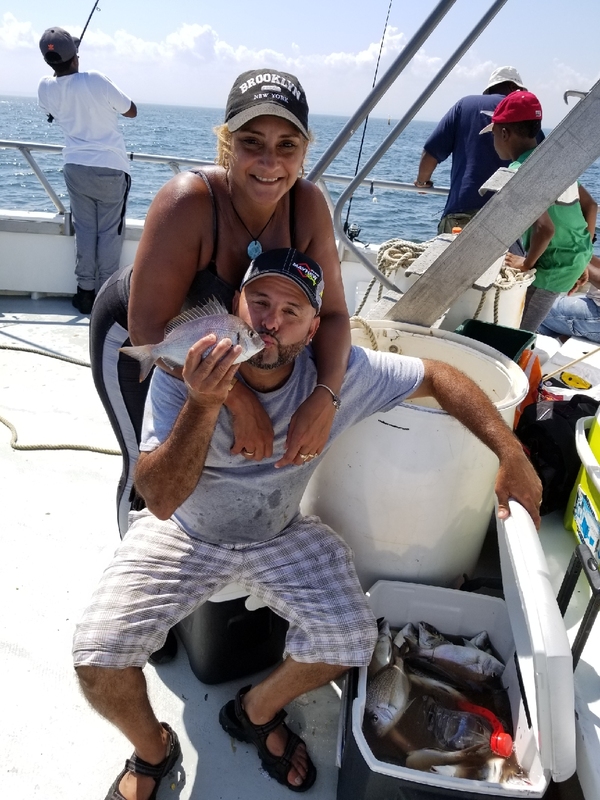 Many anglers on board the Marilyn Jean IV limited out on medium to XL scup in calm waters not far from Sheepshead Bay. We are still sailing every day and night for Porgy at 7am to 3pm and 7pm to 12am. 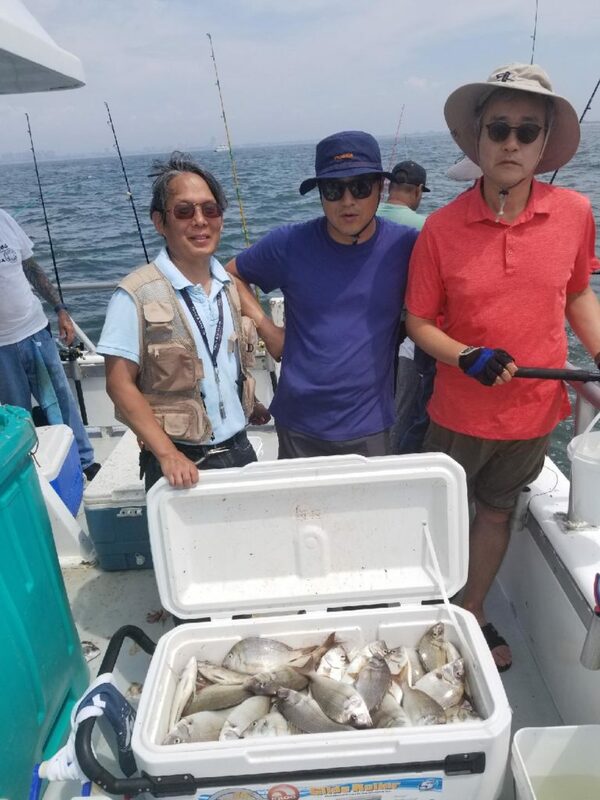 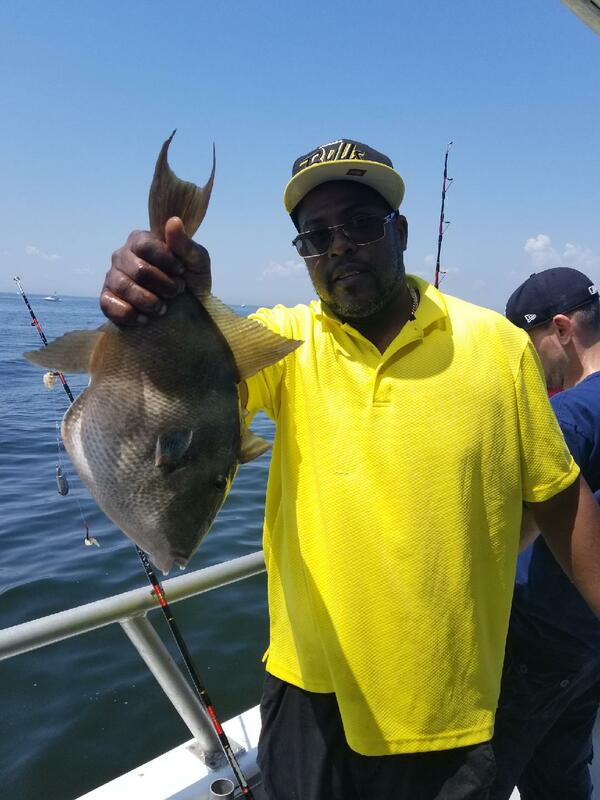 Porgy Fishing is Very Good with Blues and Seabass To ! 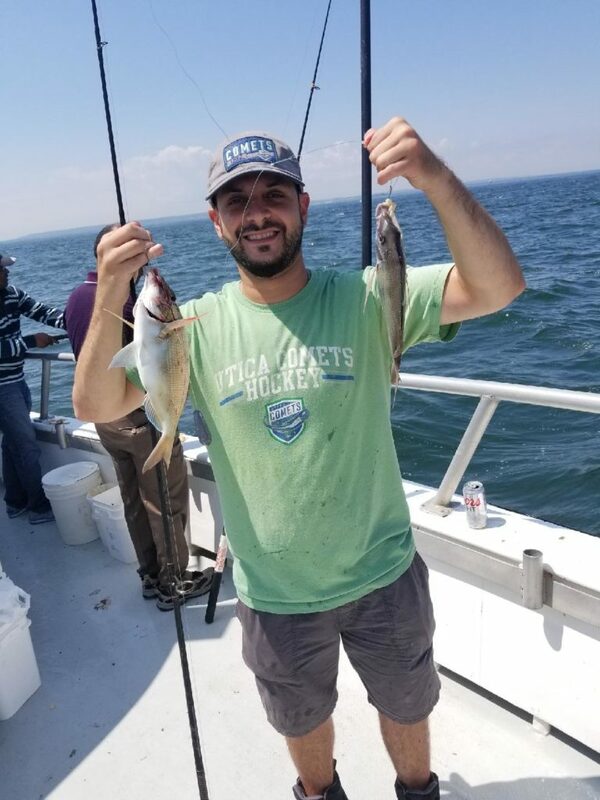 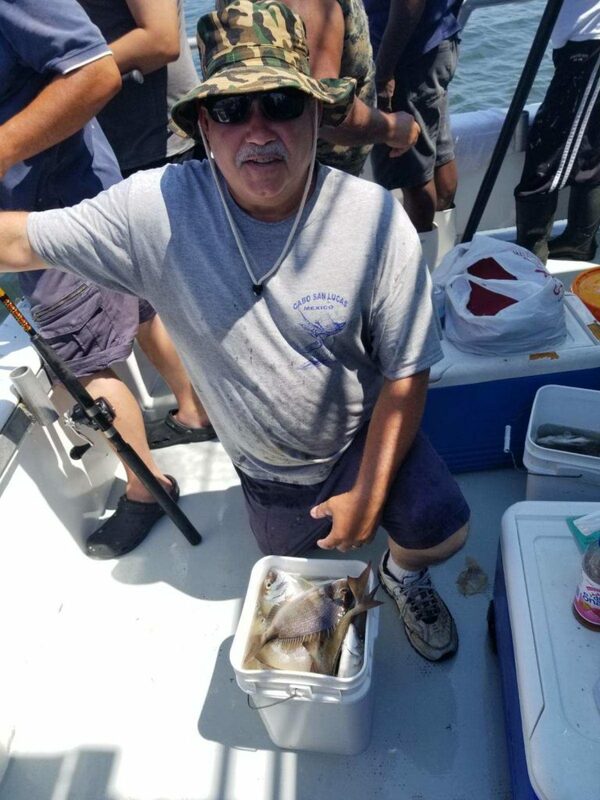 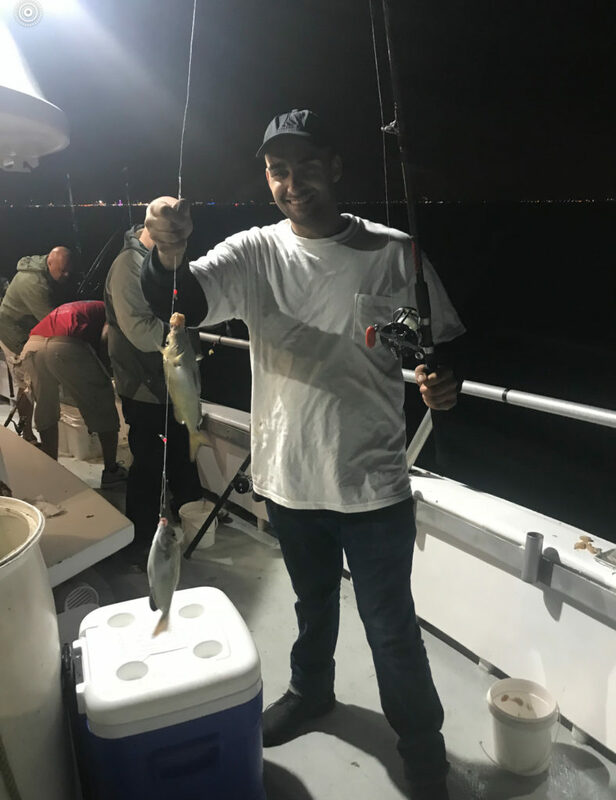 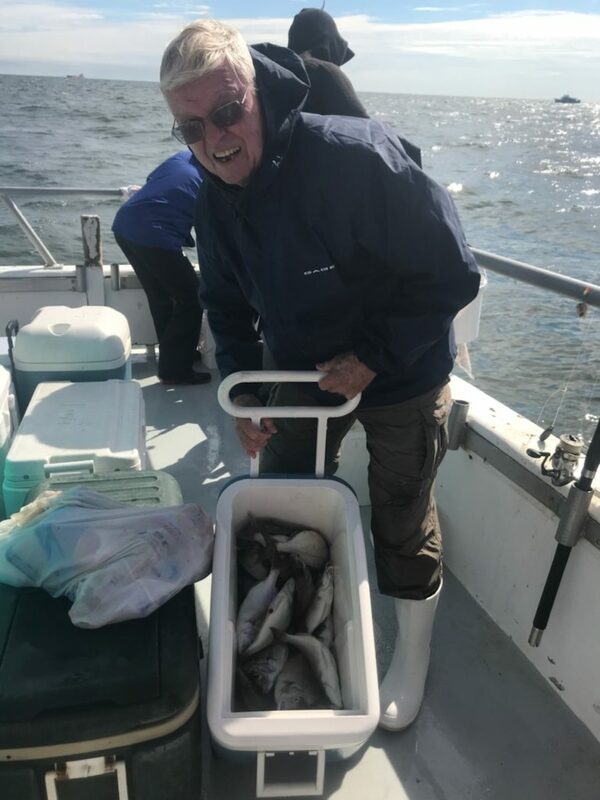 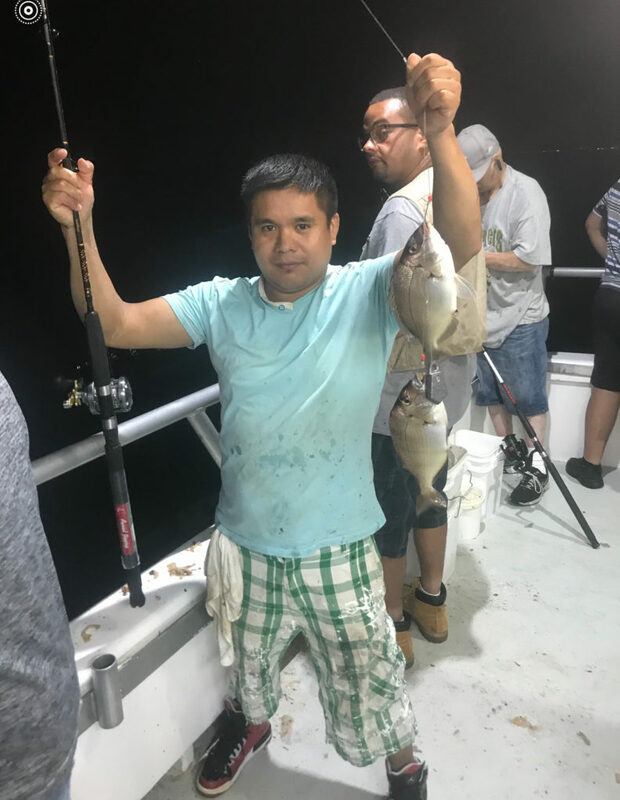 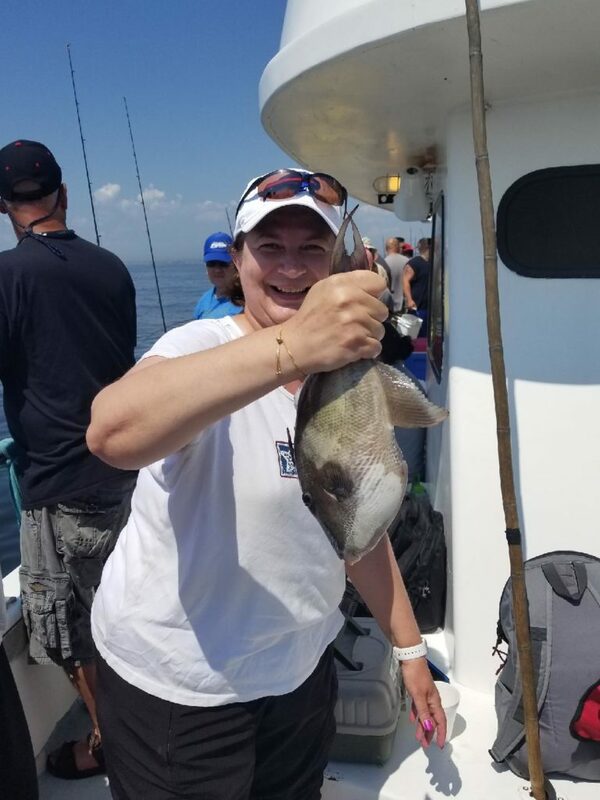 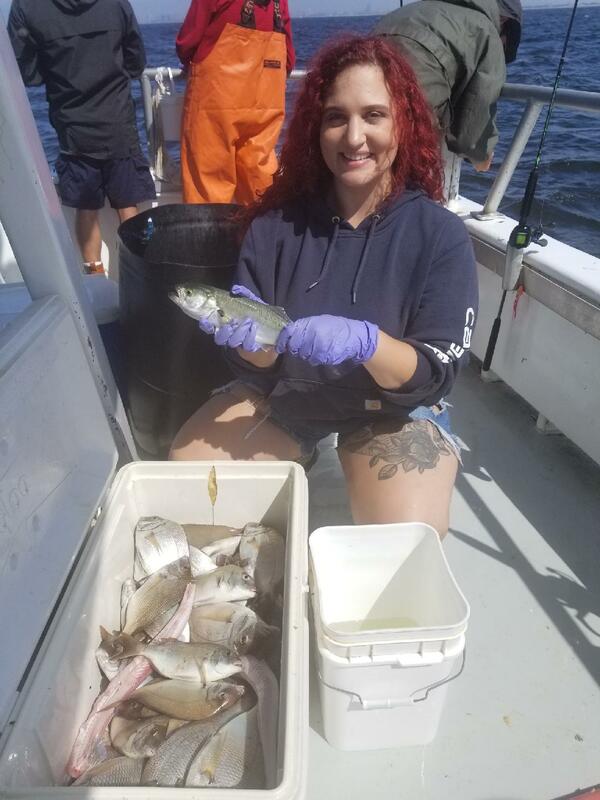 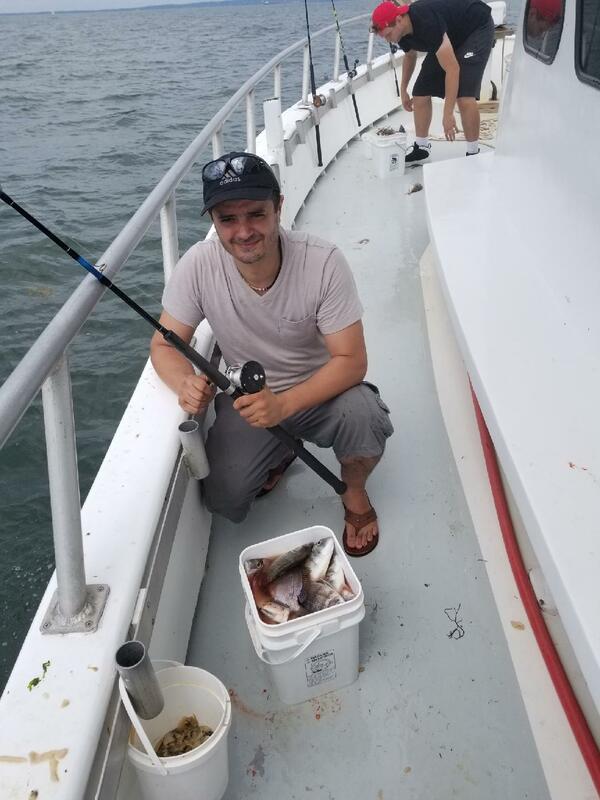 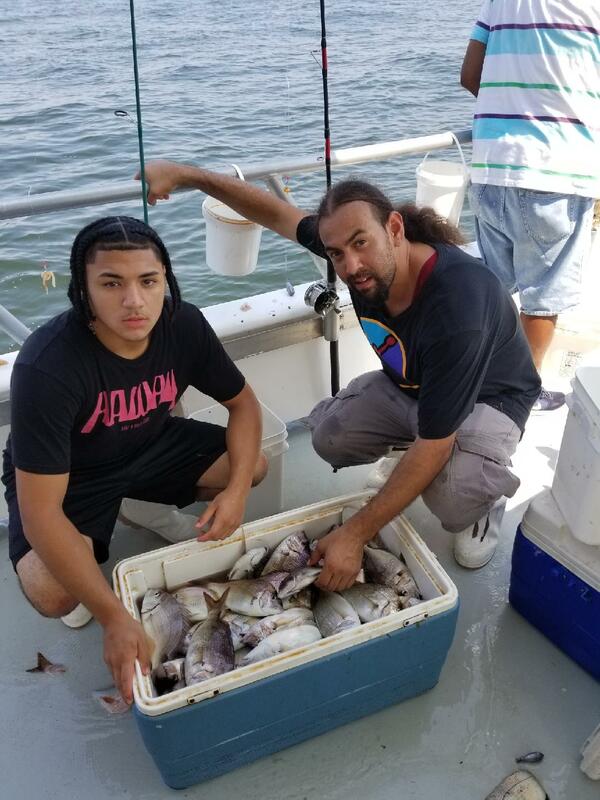 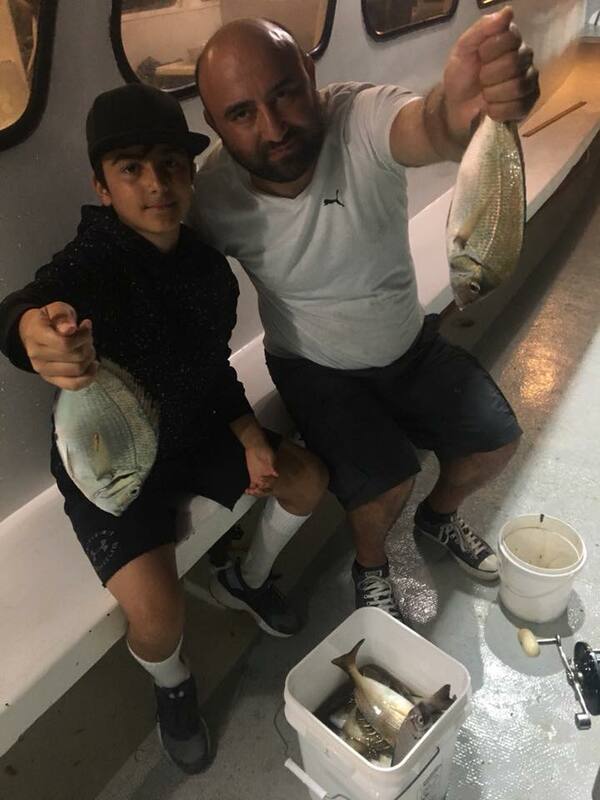 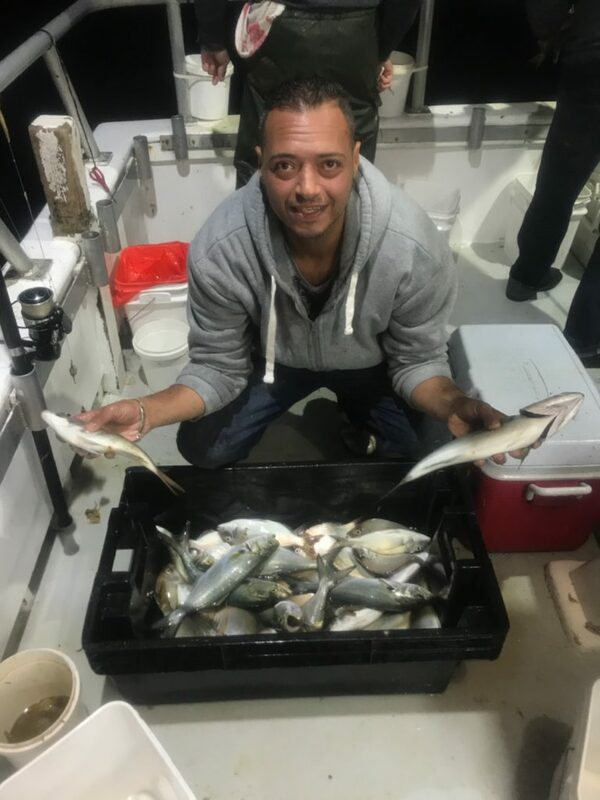 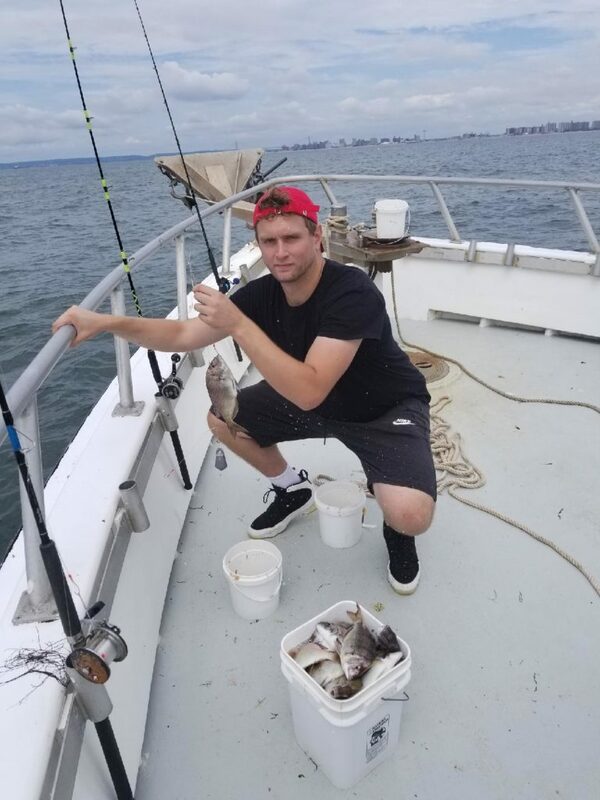 Everyday the Marilyn Jean IV in Sheepshead Bay Brooklyn is catching a lot of Porgy’s on our day and night fishing trips. 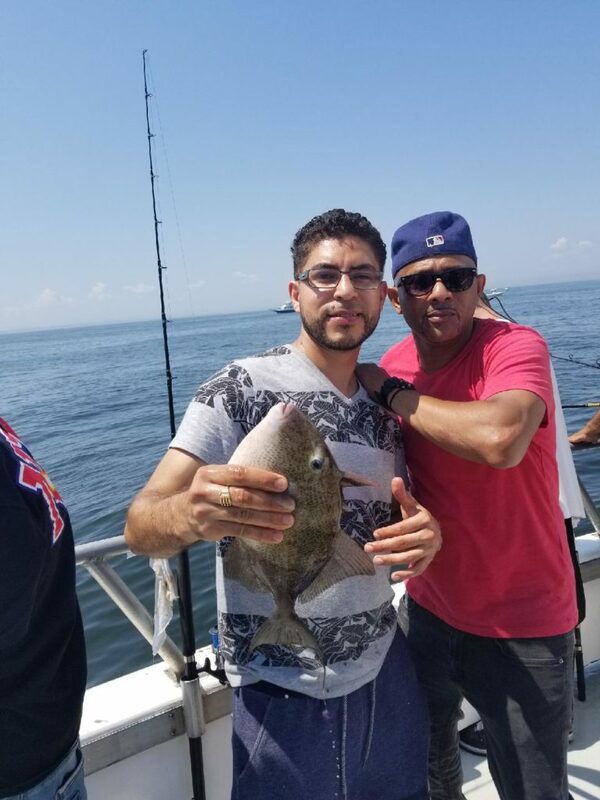 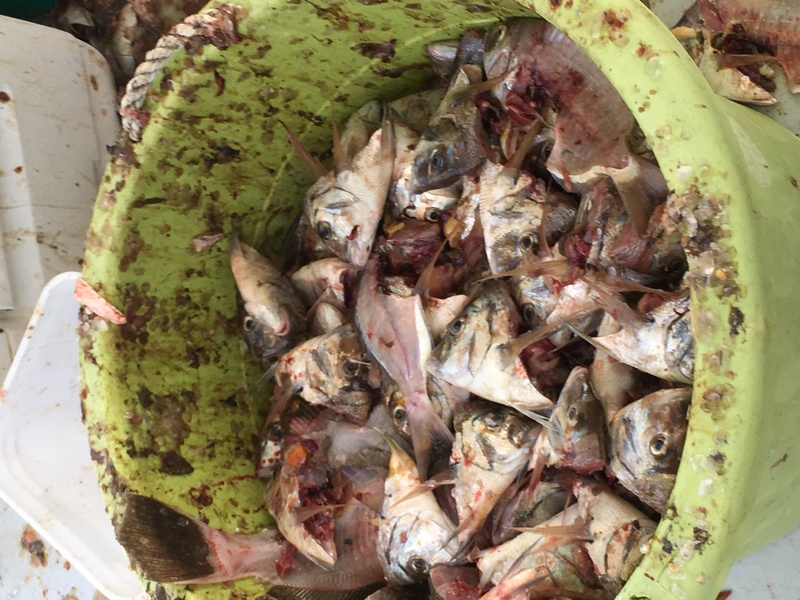 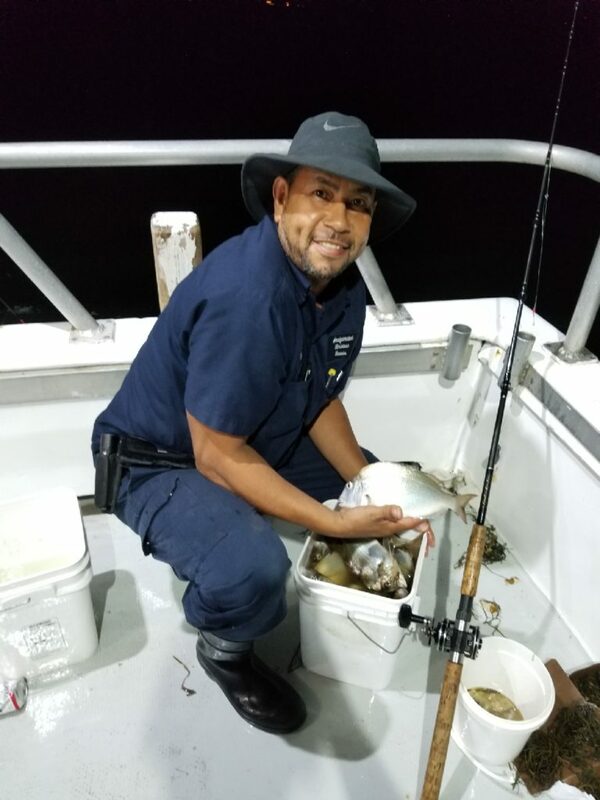 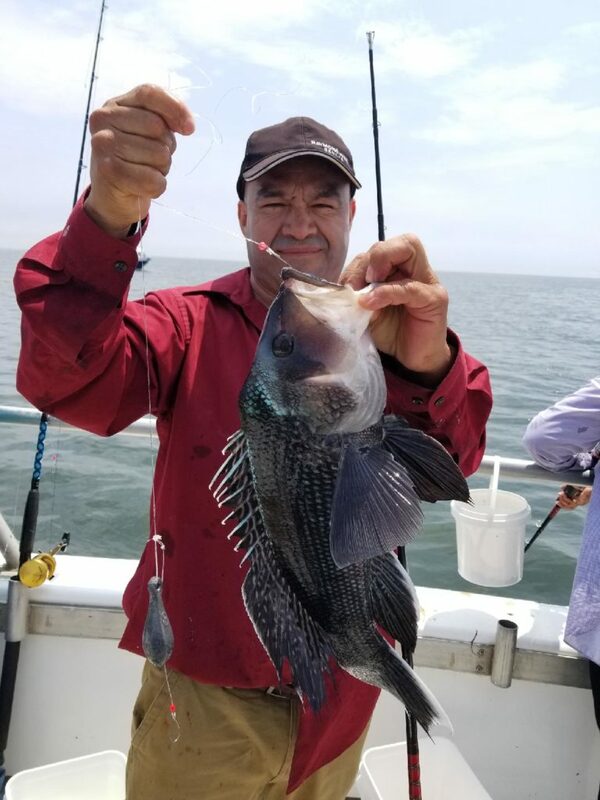 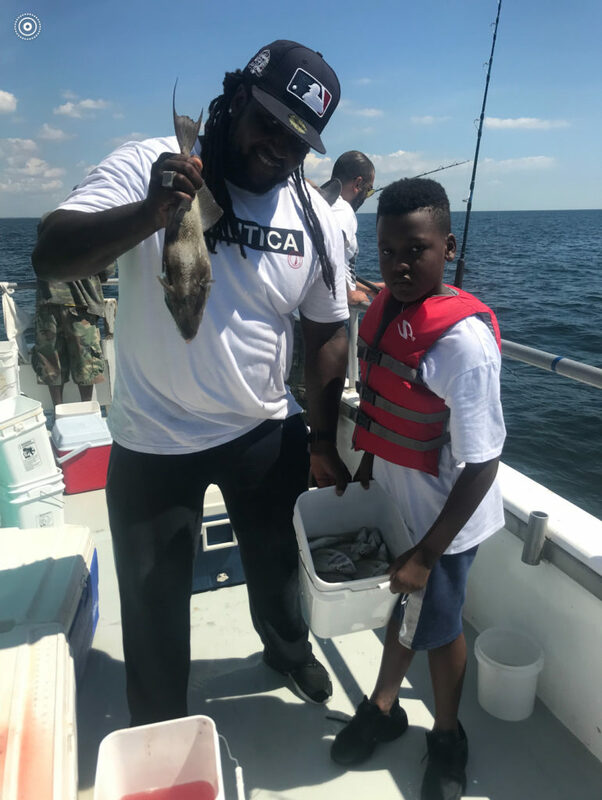 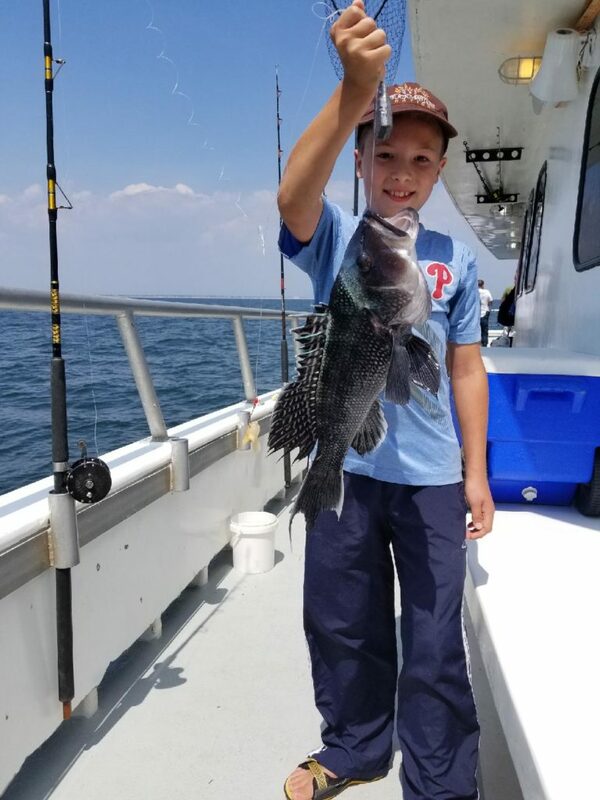 Many fisherman, fisherwomen and children are catching their full limit of Porgy’s. 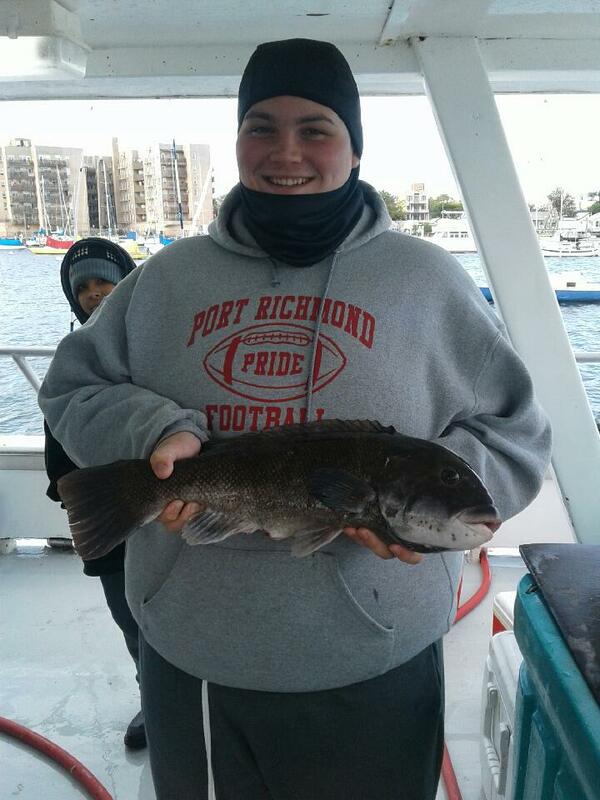 On the 7am trips we also see nice Seabass and Triggerfish mixed in. 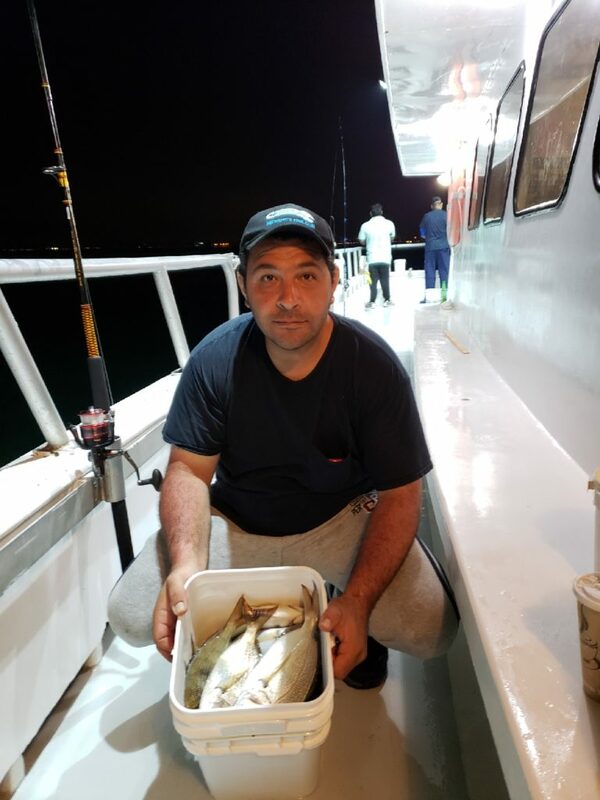 At night we are getting cocktail Bluefish along with the Porgies. 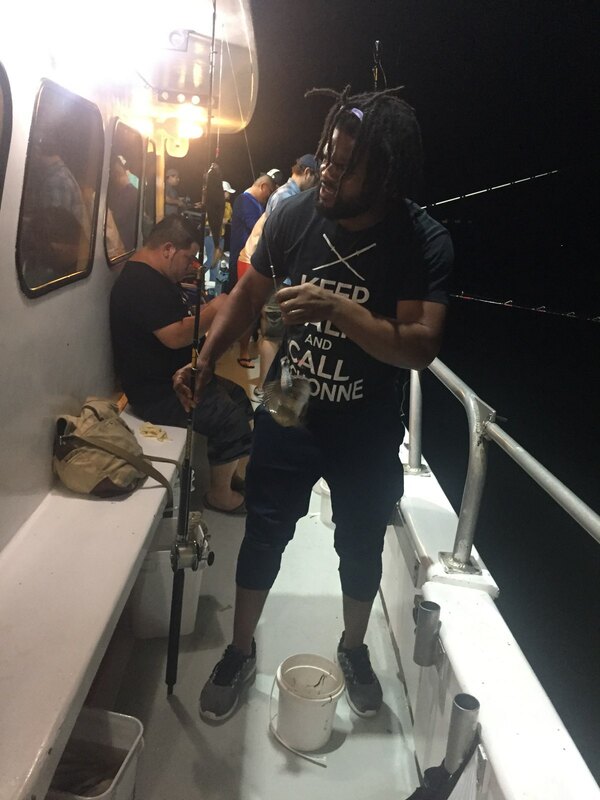 We sail everyday and night. 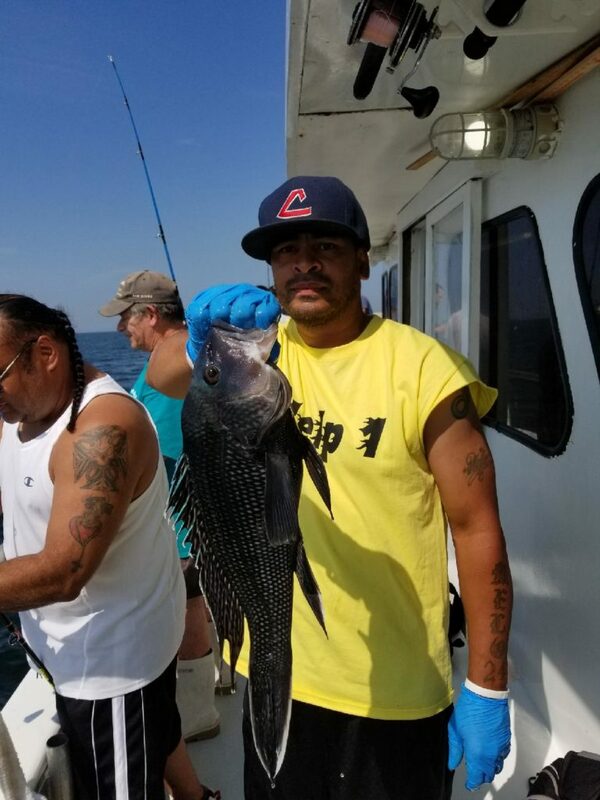 Check out these pics of some of our recent catches. 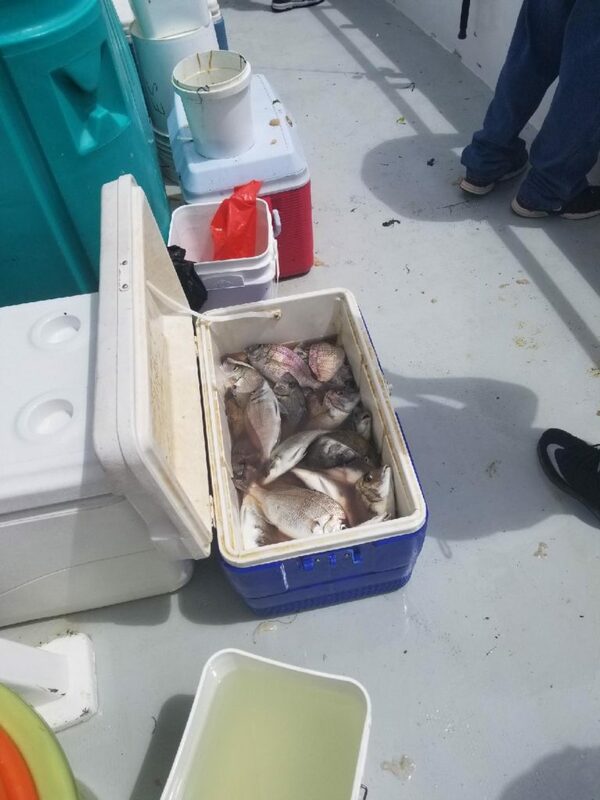 Big Porgys Day n Night Now with a 45 Fish per Person Limit !! 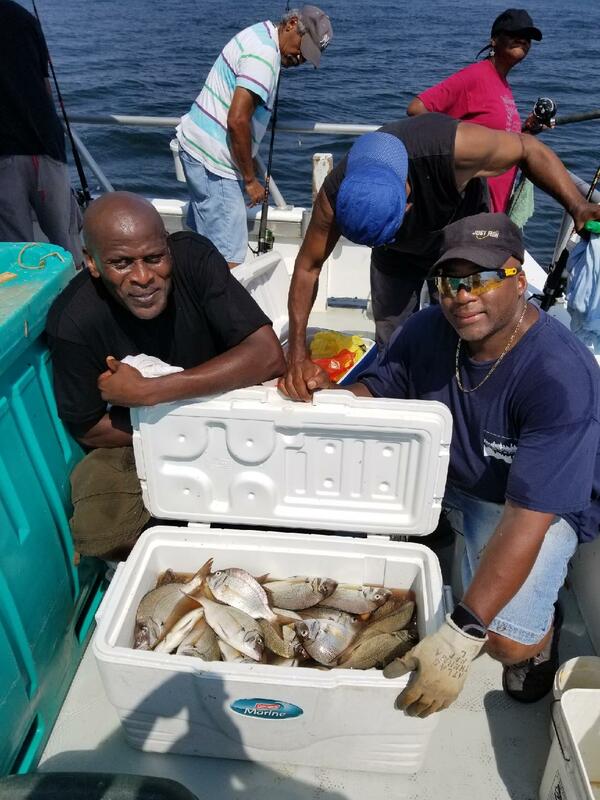 The porgy fishing remains as good as it gets. 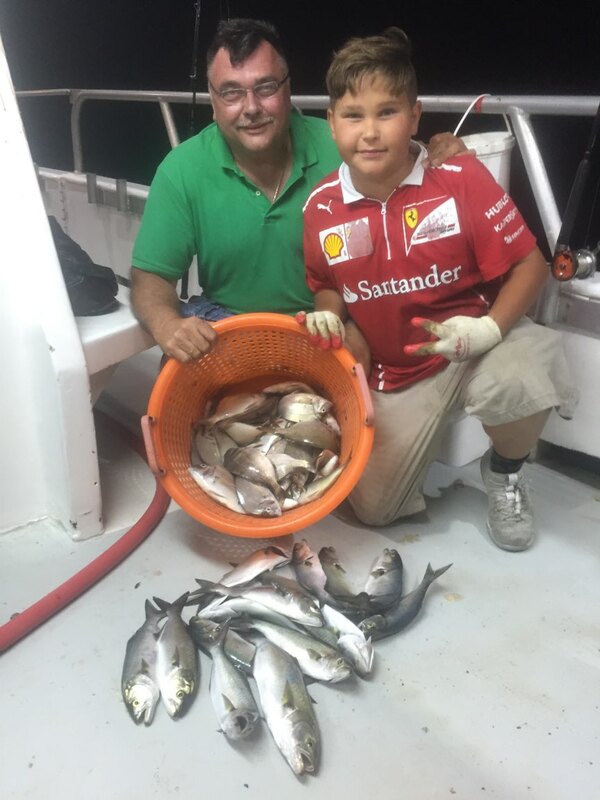 Both the day and night trips have been filling up a nice big sized Scup. 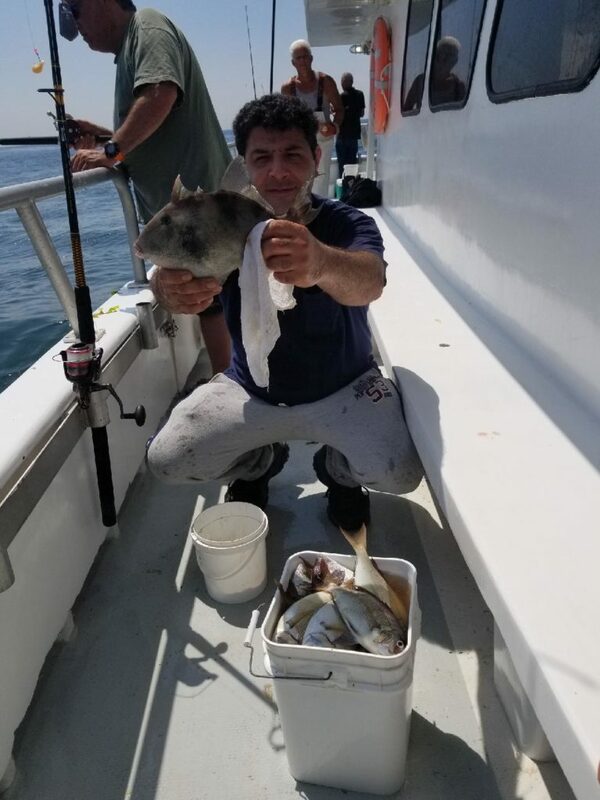 We have found some very large porgies on some trips. 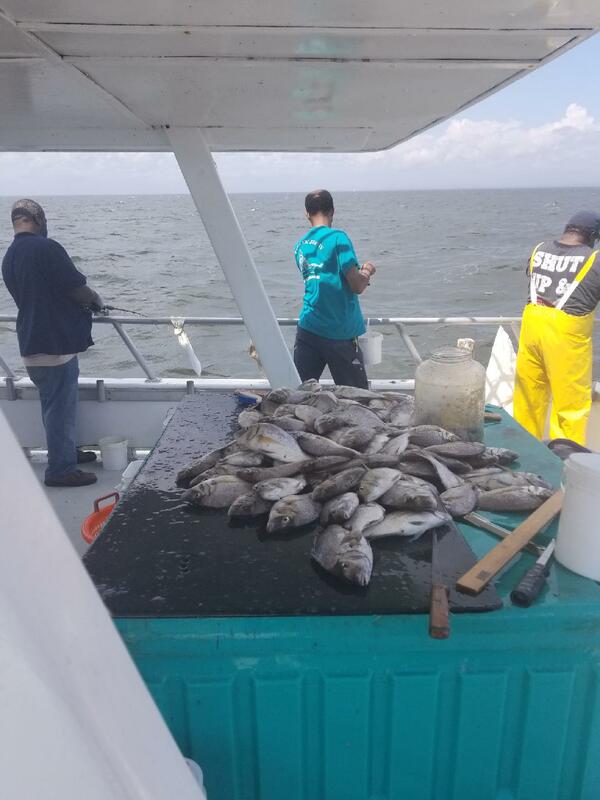 To make things even better the New York State limit on porgies is now at 45 fish per person ! 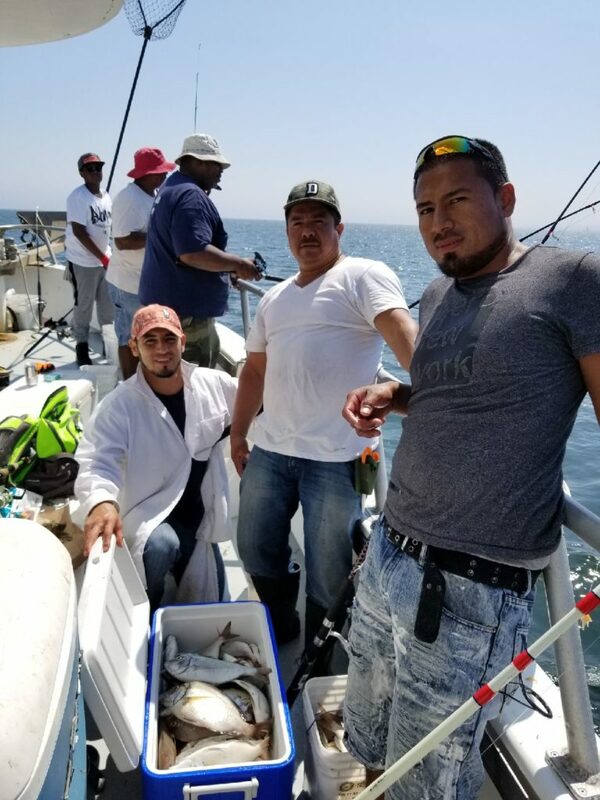 And the Seabass limit has also gone up to seven fish per person. 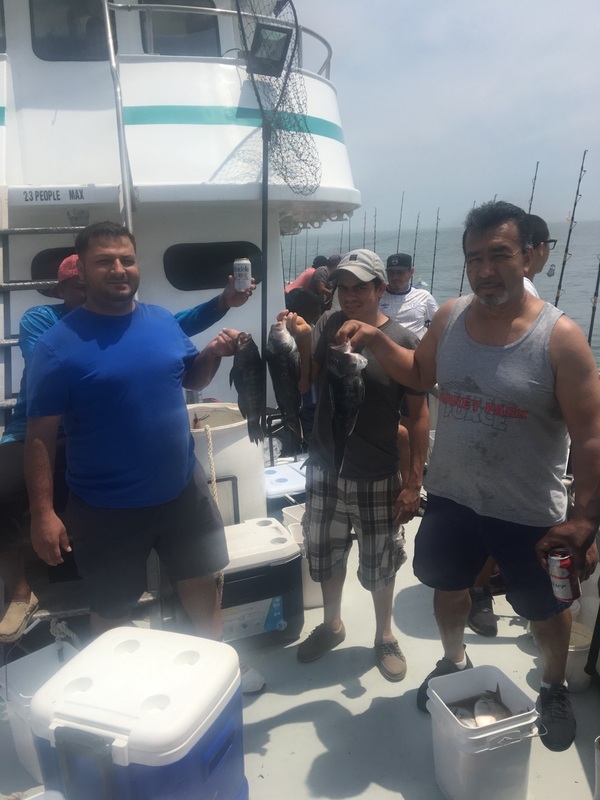 So come on down and get yours while the weather is still great. 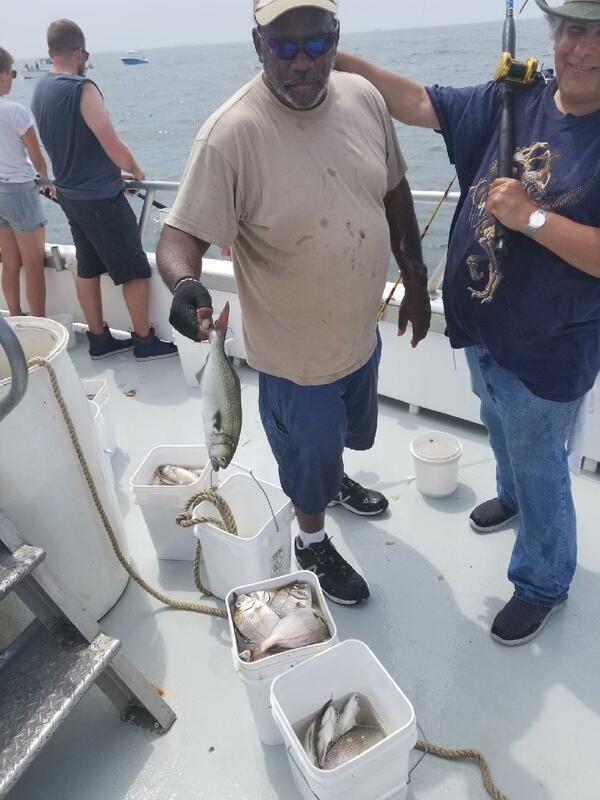 We sail two fishing trips everyday from pier 6 in Sheepshead Bay Brooklyn, NY. 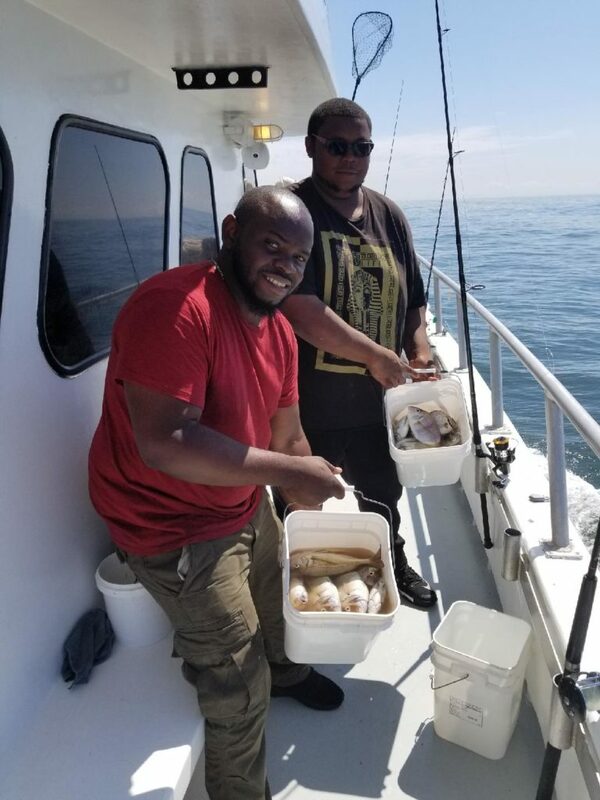 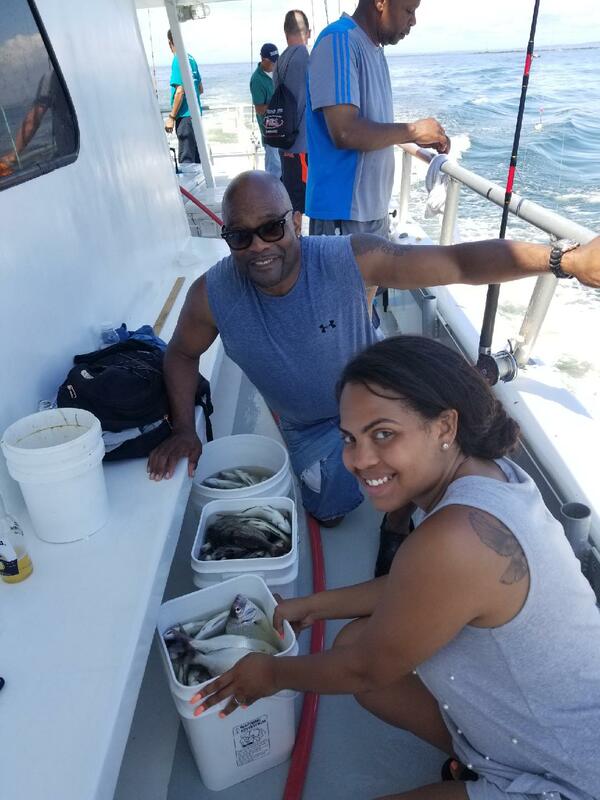 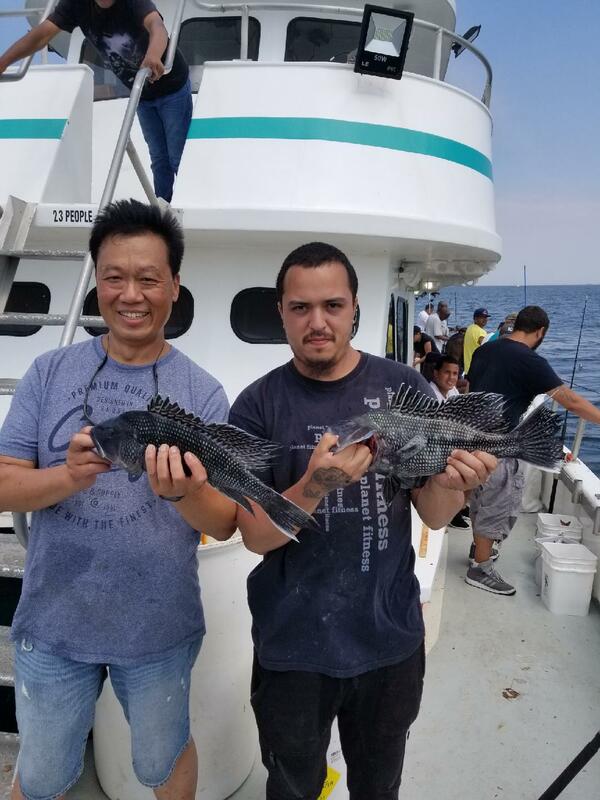 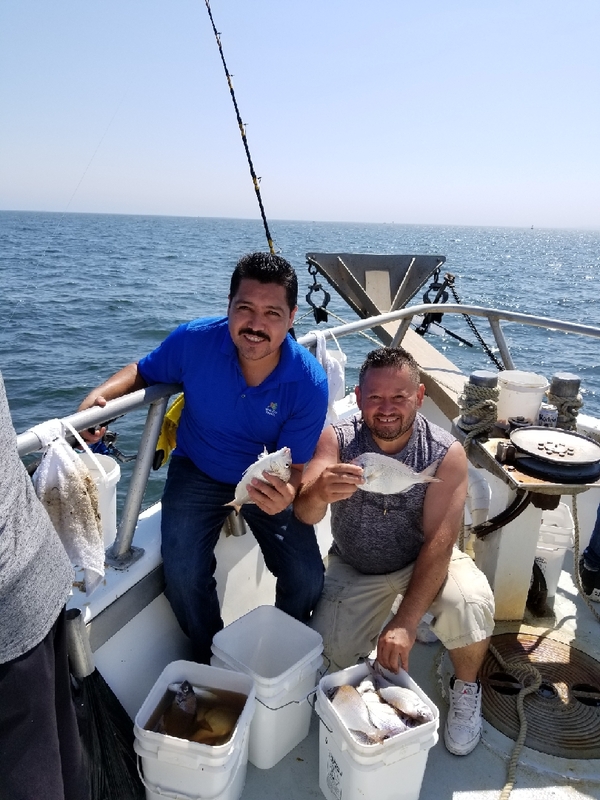 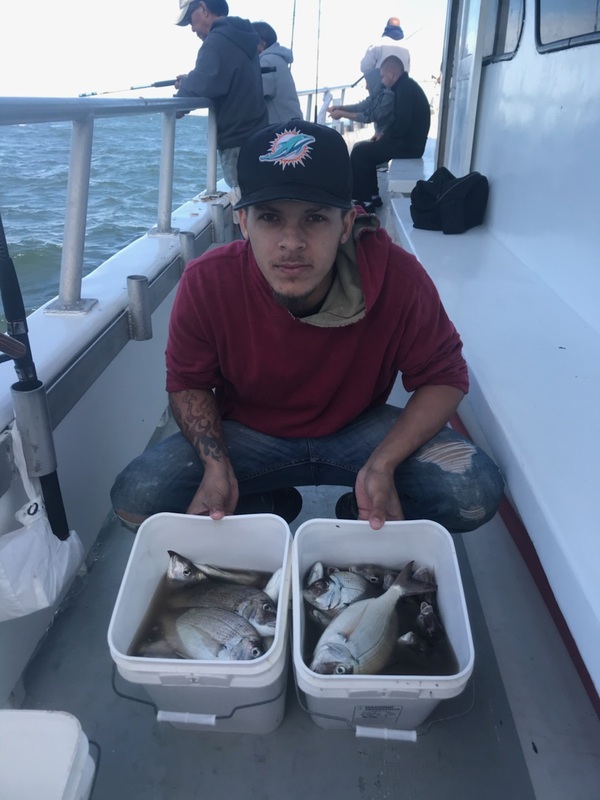 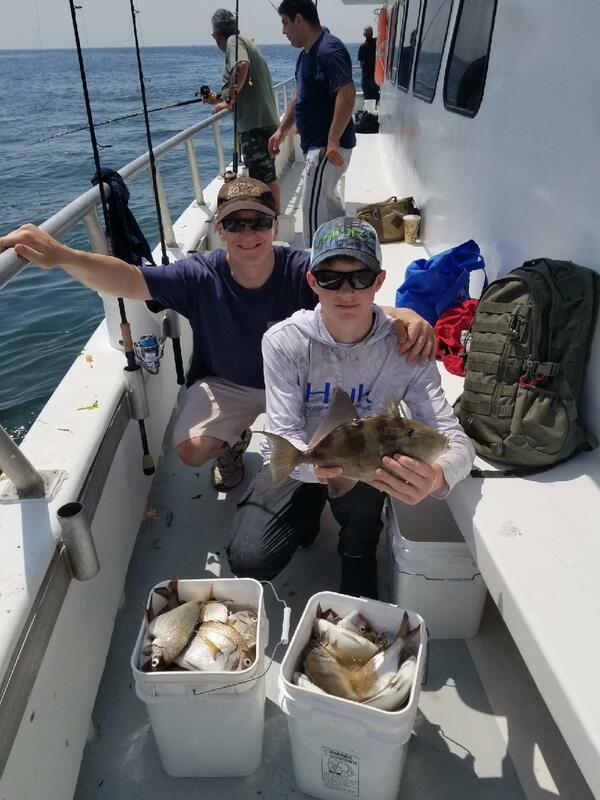 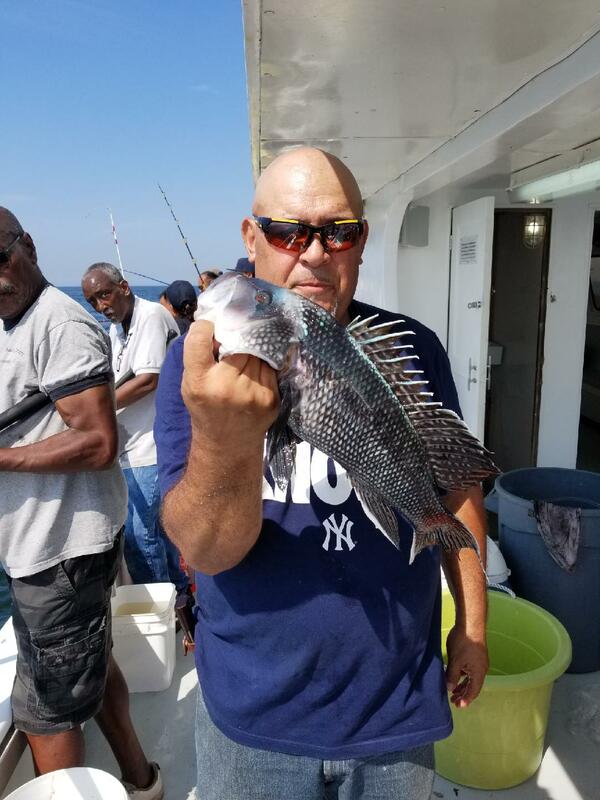 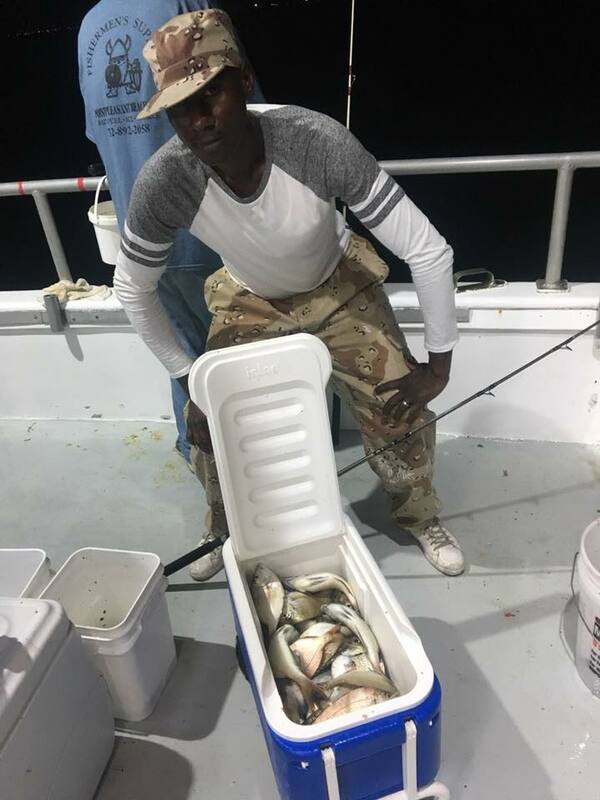 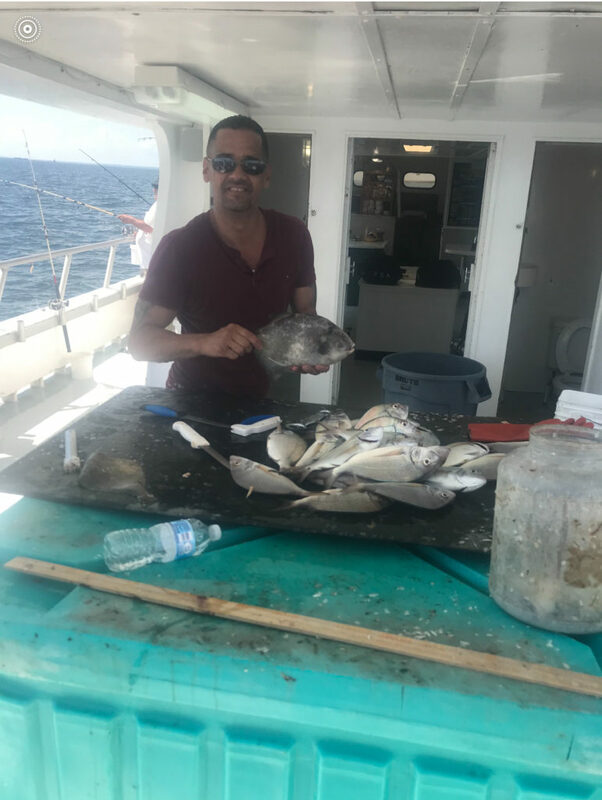 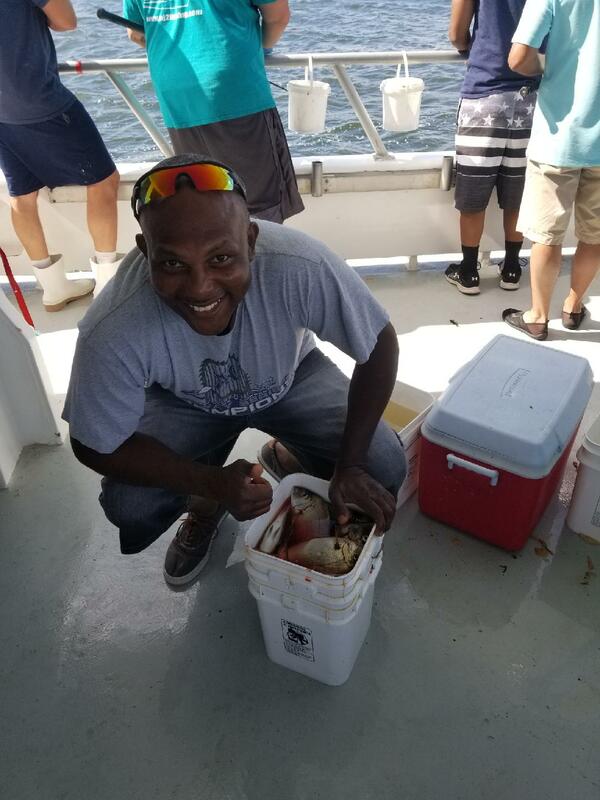 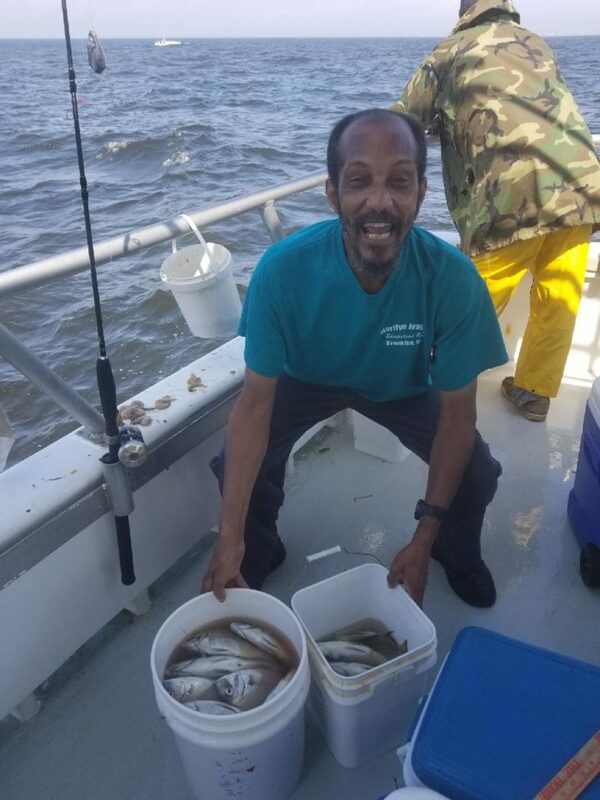 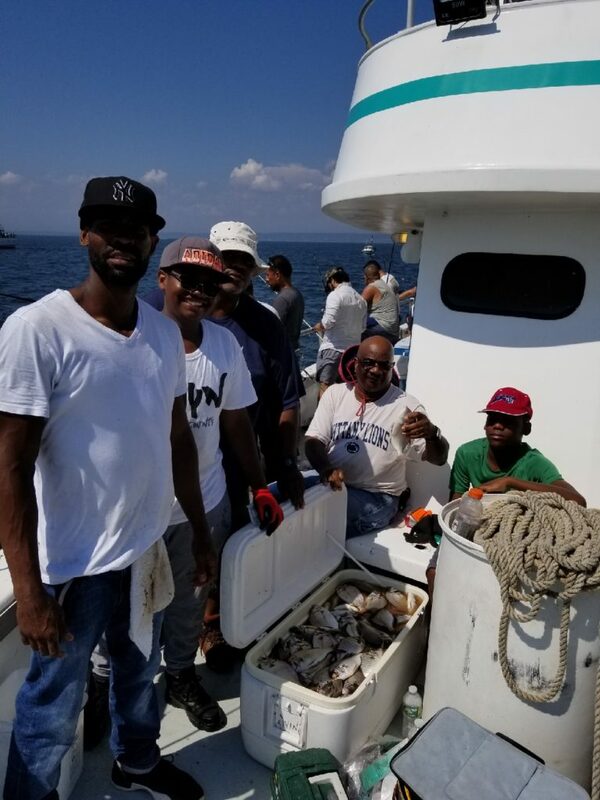 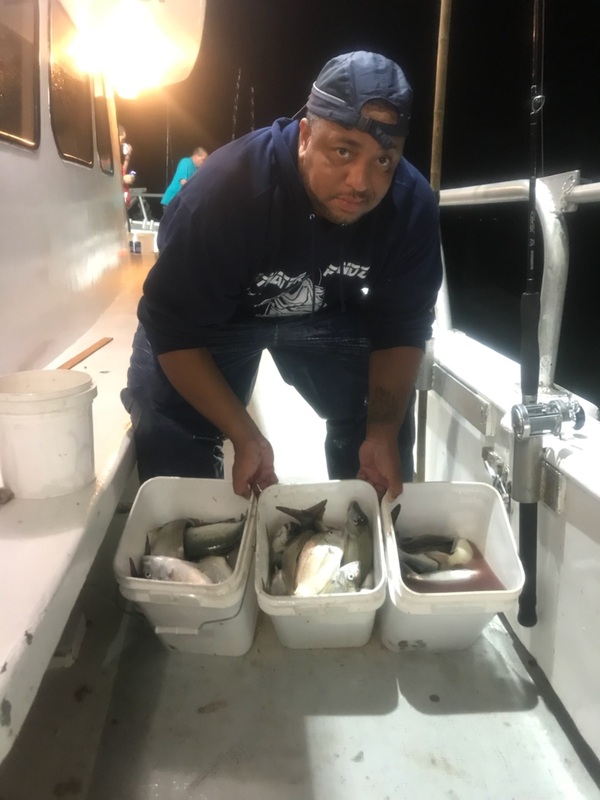 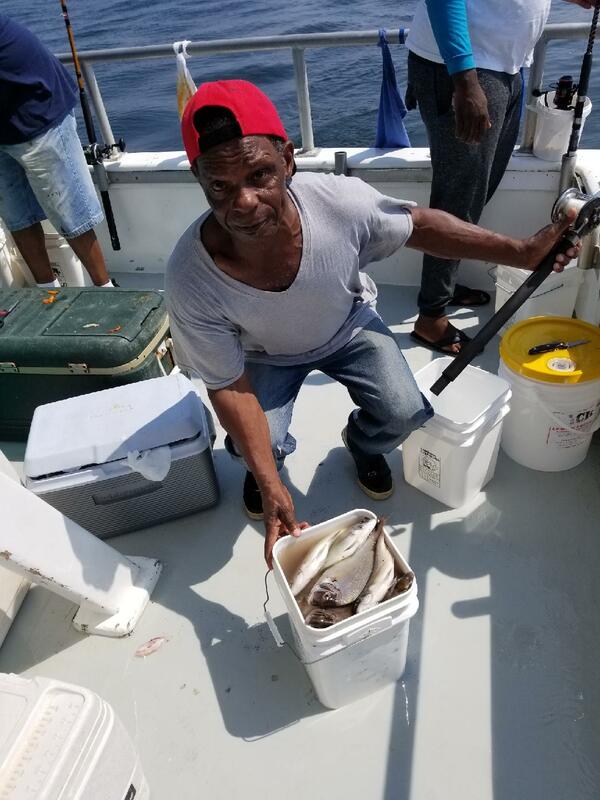 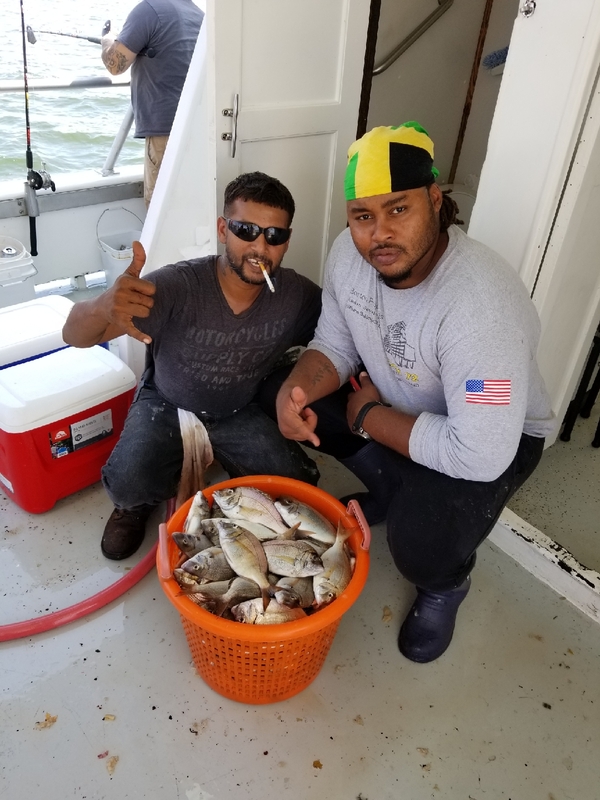 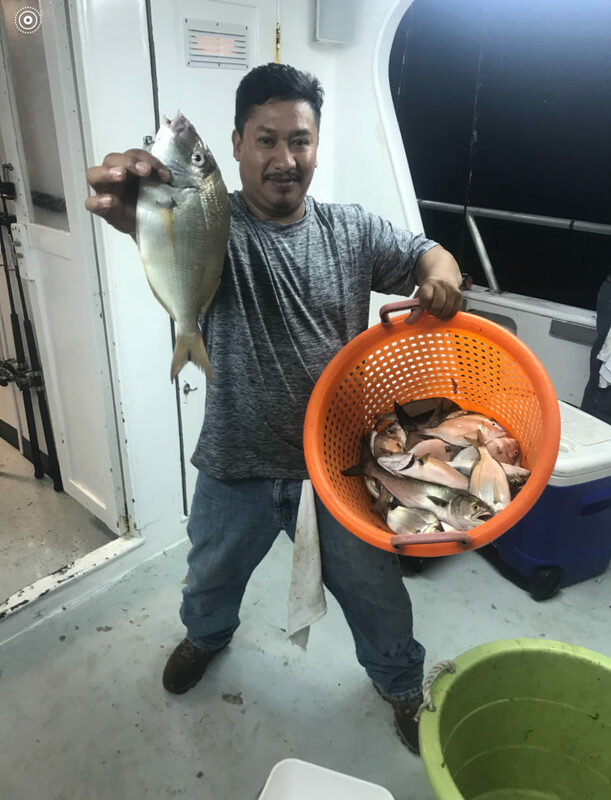 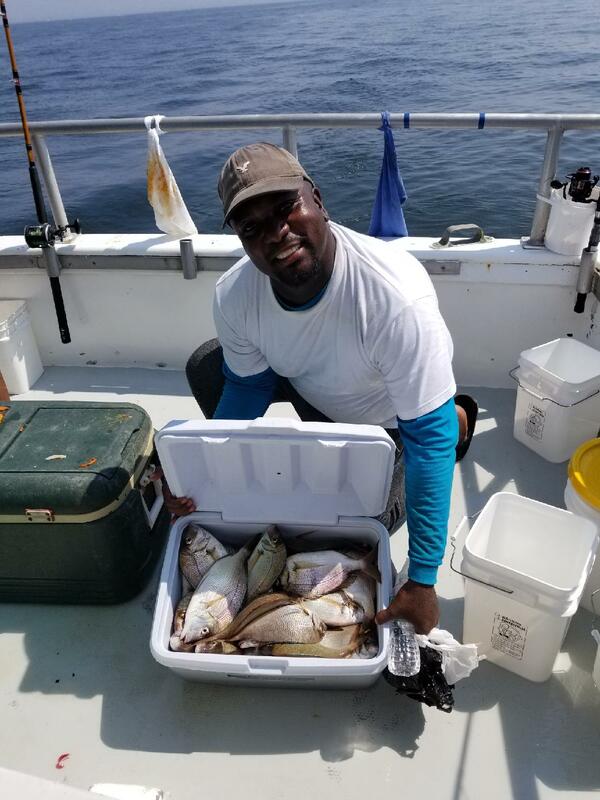 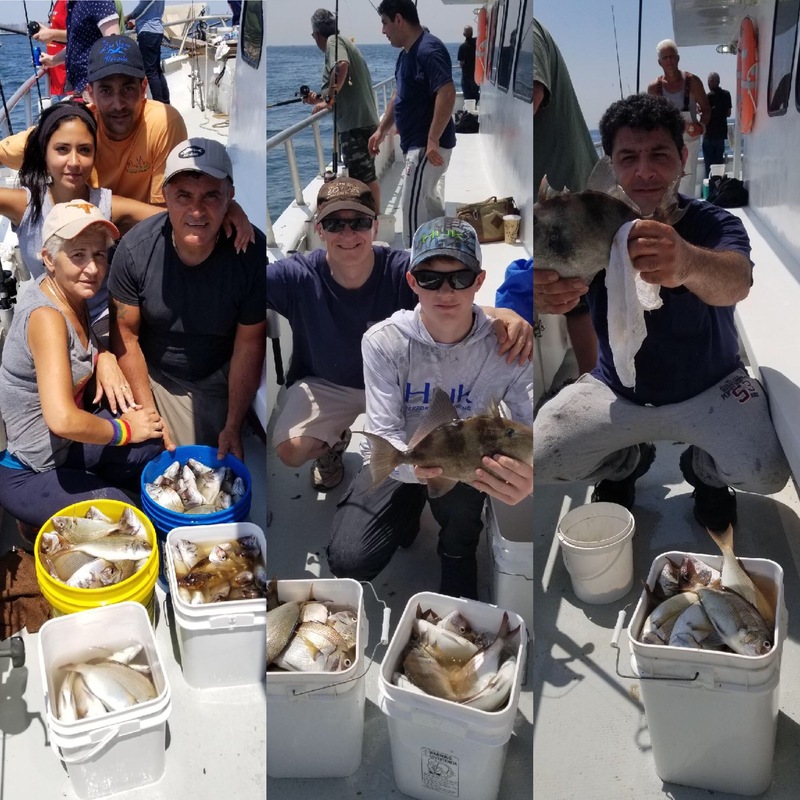 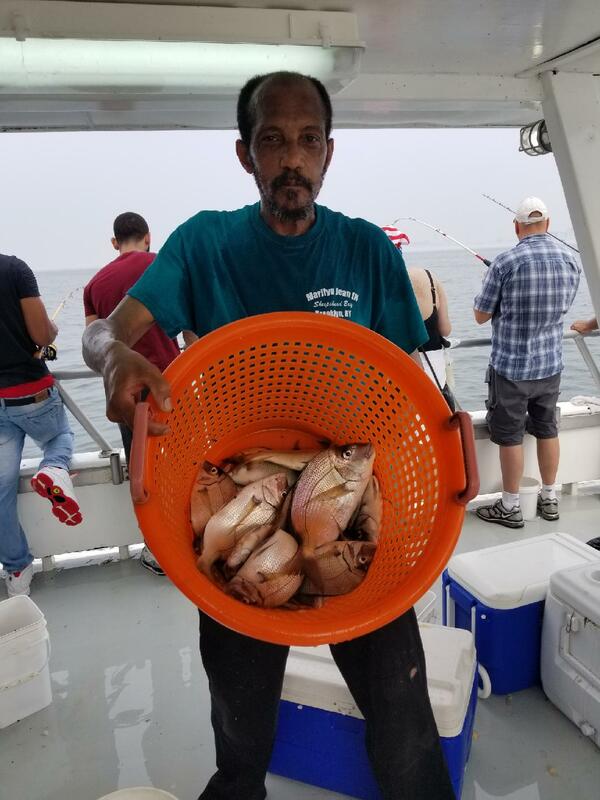 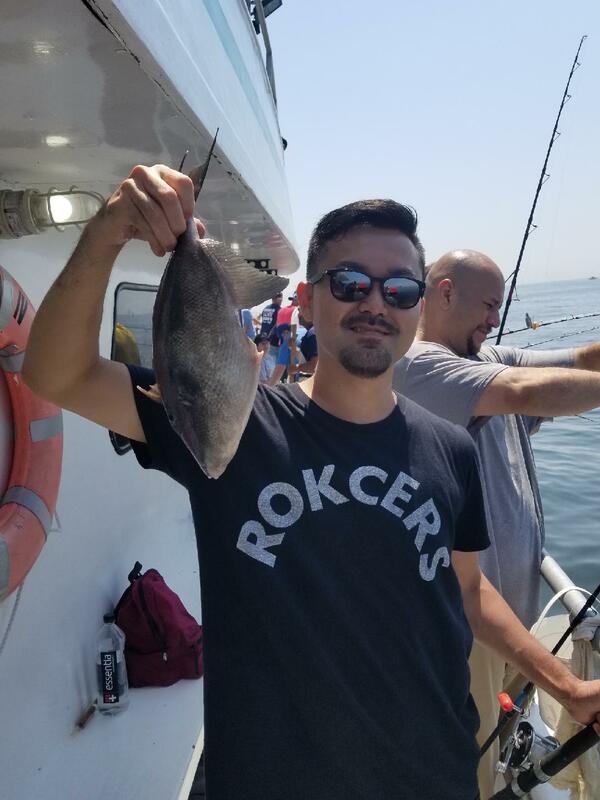 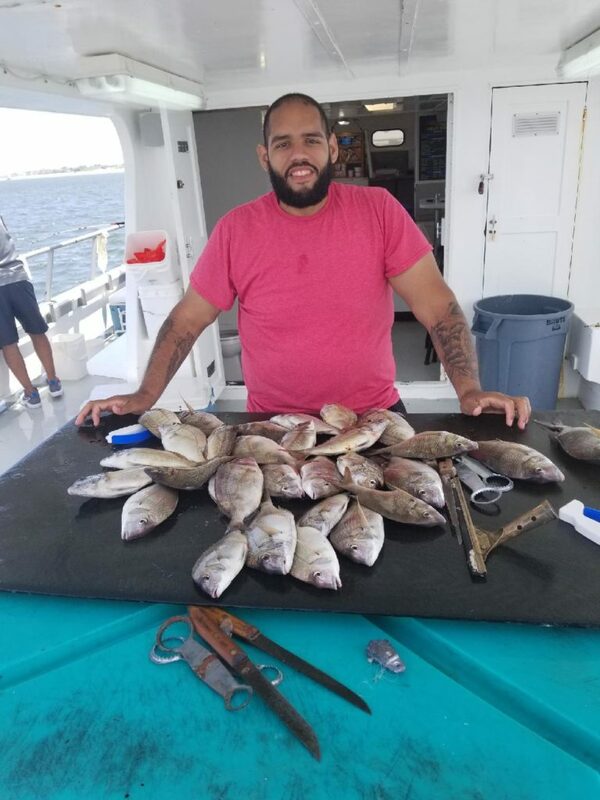 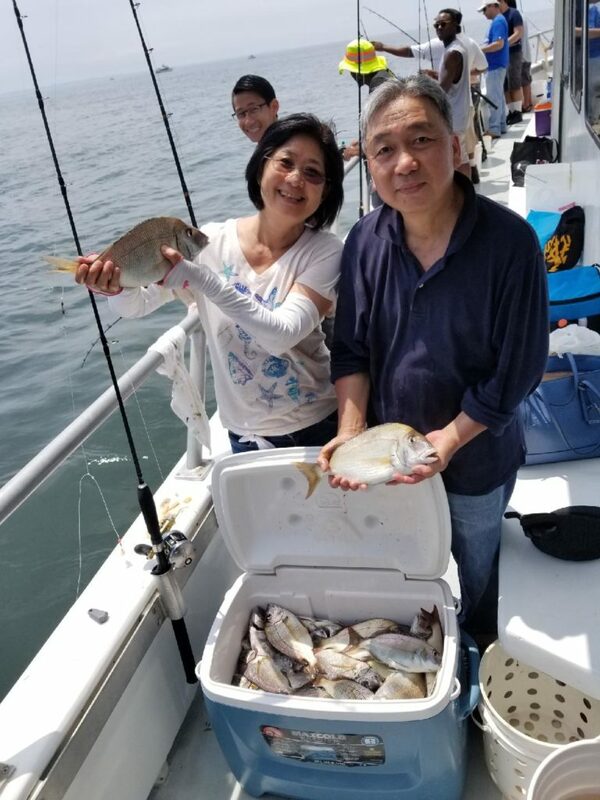 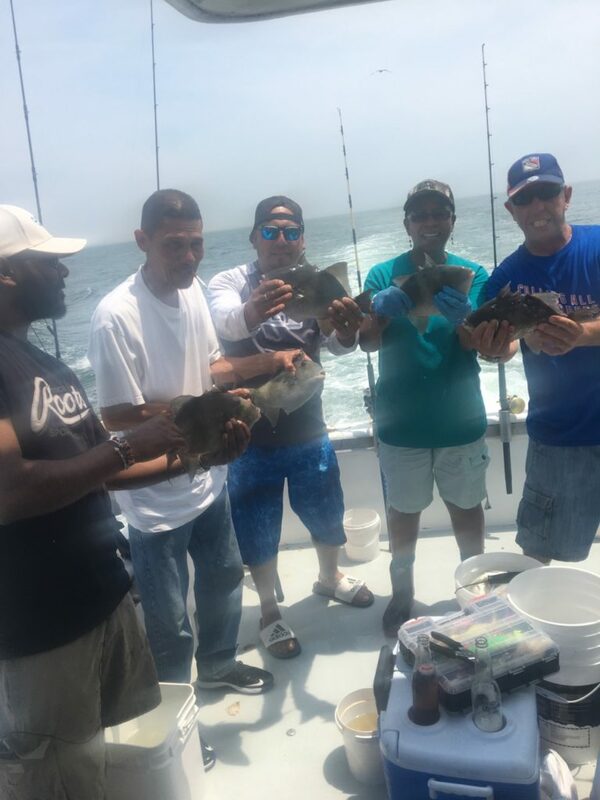 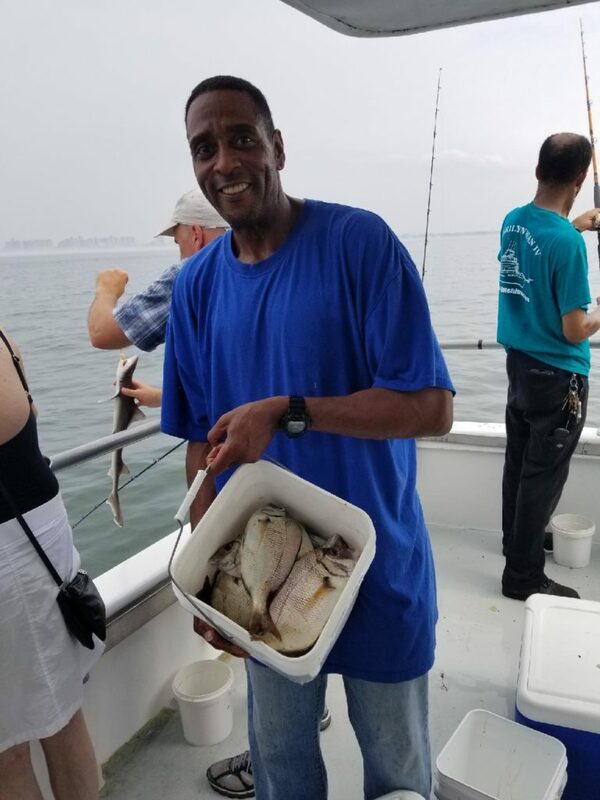 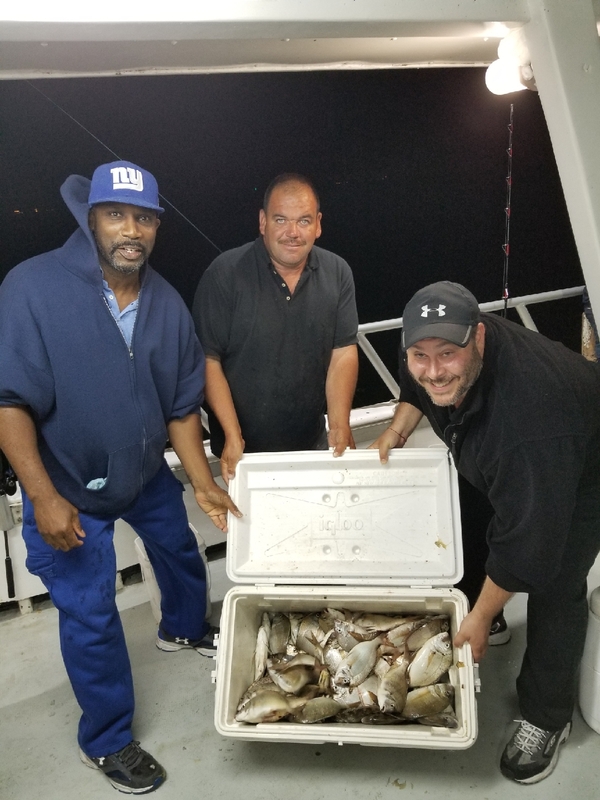 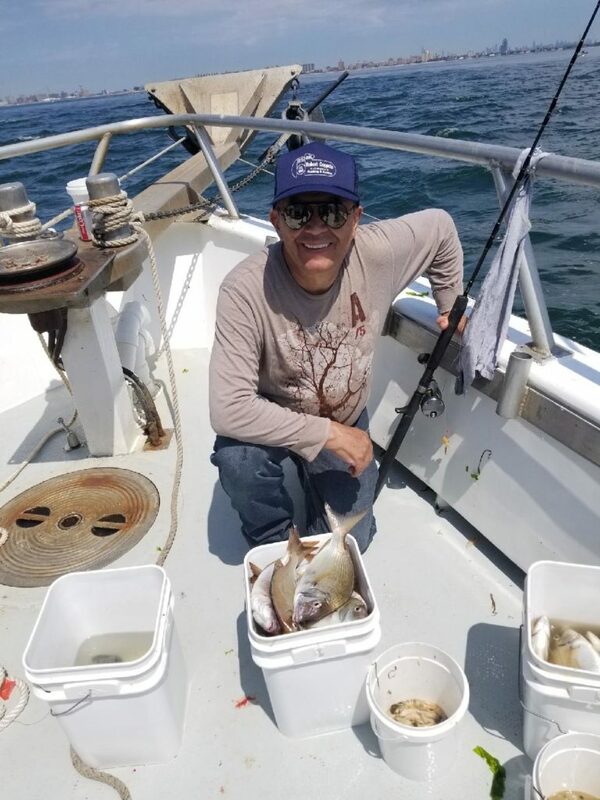 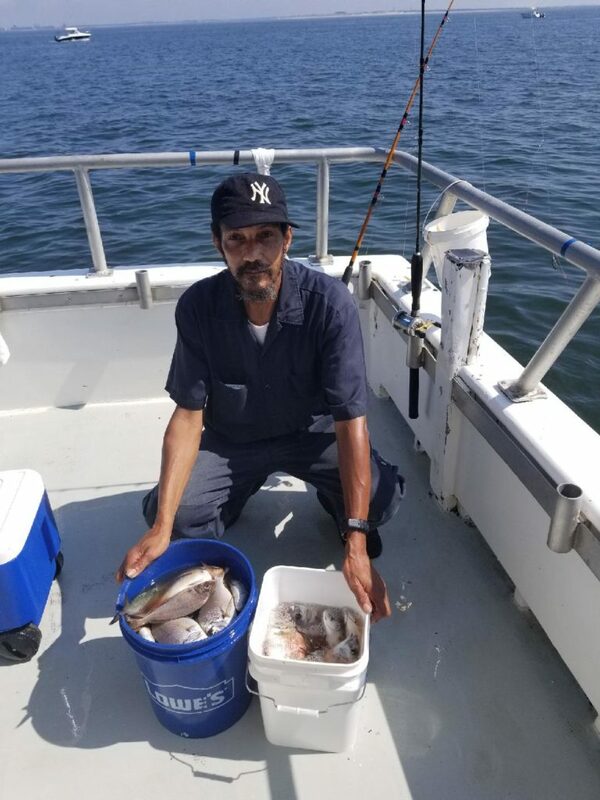 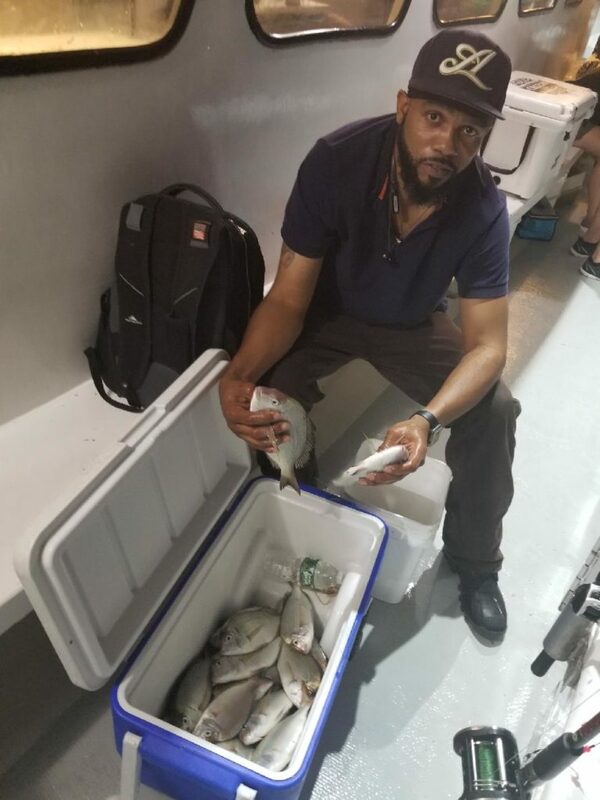 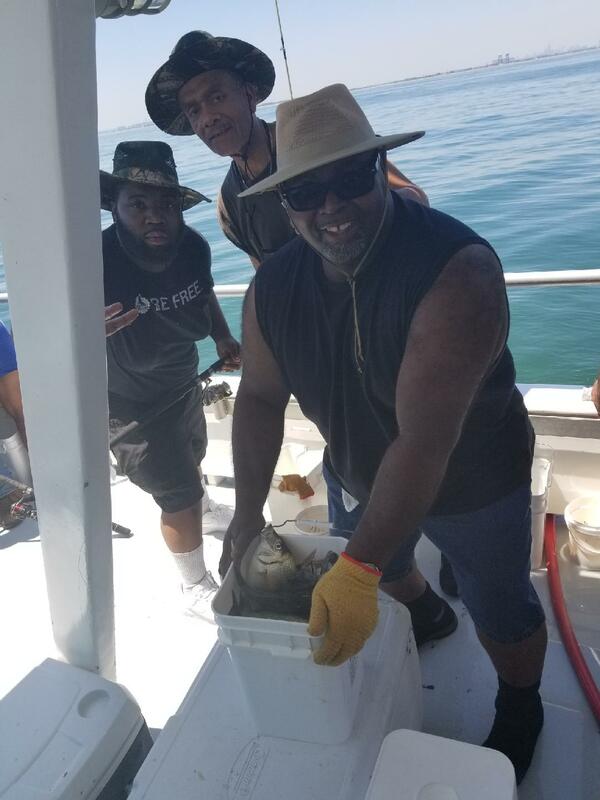 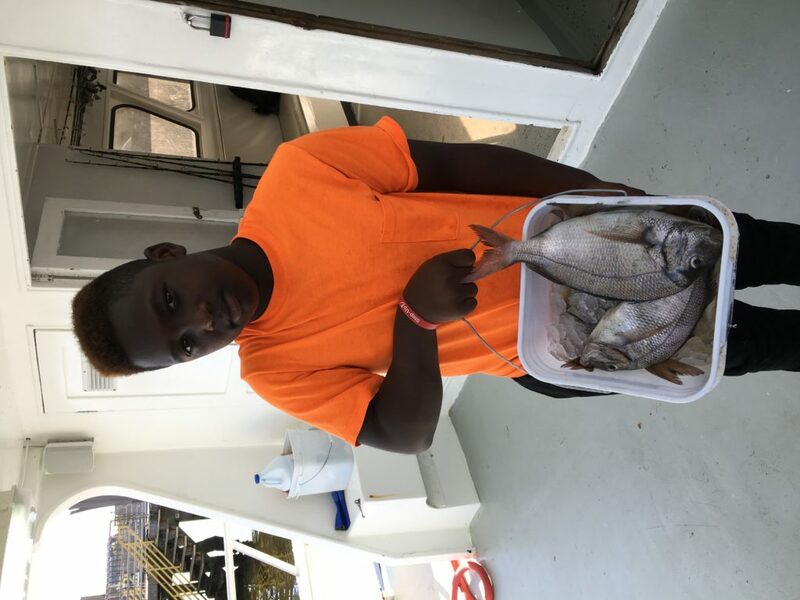 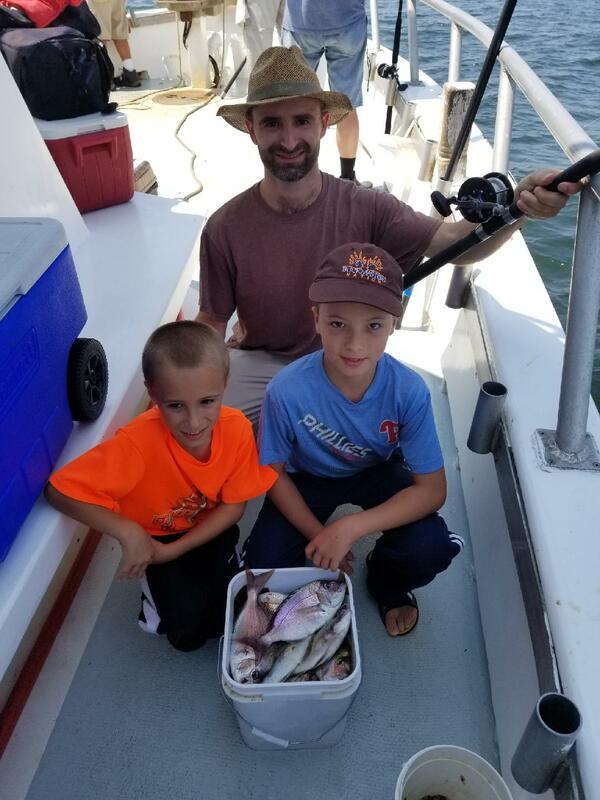 Take a look at these recent catches of Porgy’s on the Marilyn Jean IV. 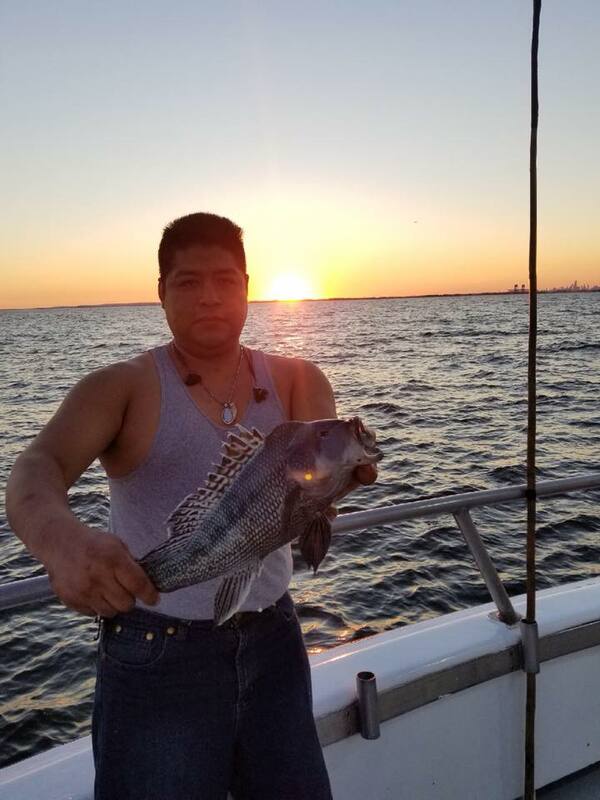 Nice Weather is Finally Here And The Fishing is Still Amazing !! 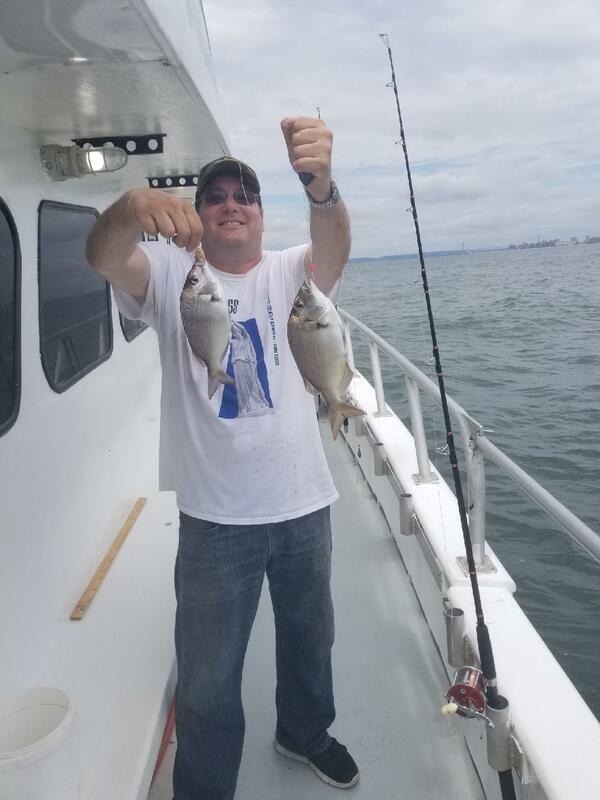 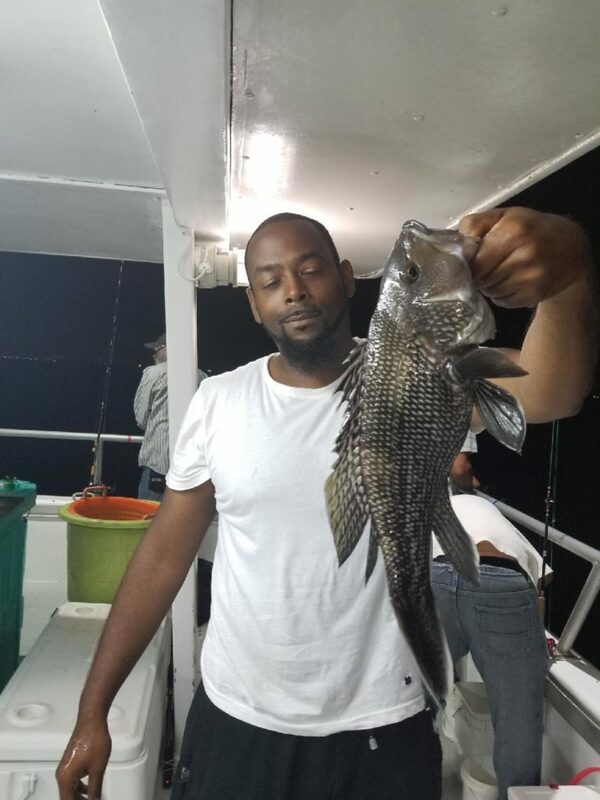 The Porgy’s continue to bite their heads off ! 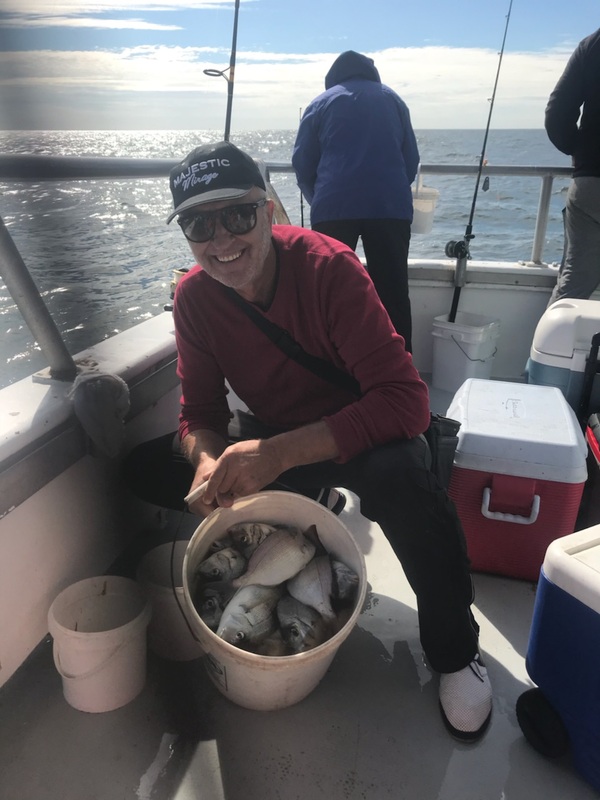 There are also the usual mix of Seabass, Triggerfish, Fluke and Mackerel around. 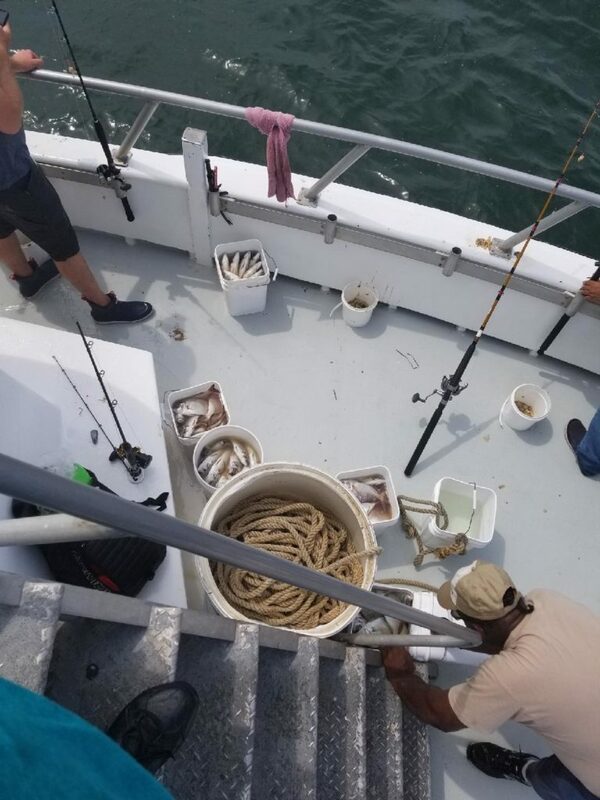 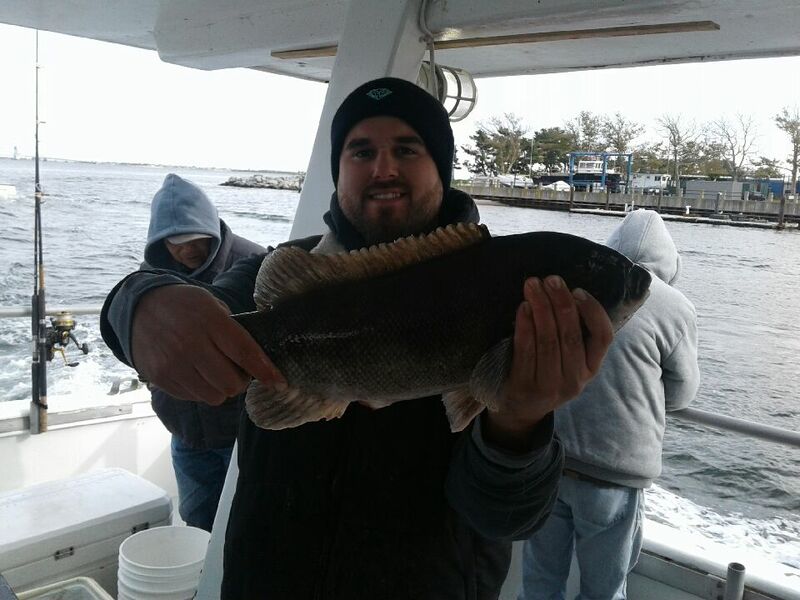 7am to to 3pm & 7pm to 12am trips have continued to load up on fish with average catches of 20-50 keepers per person. 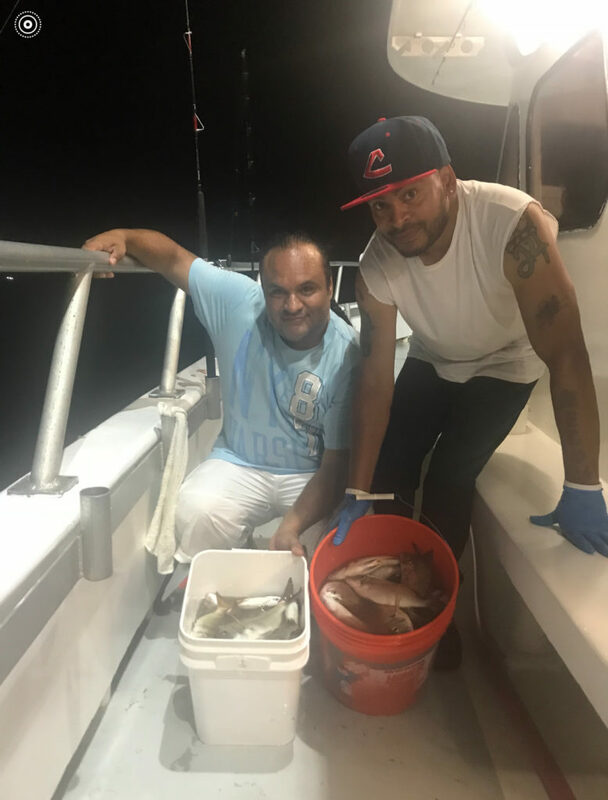 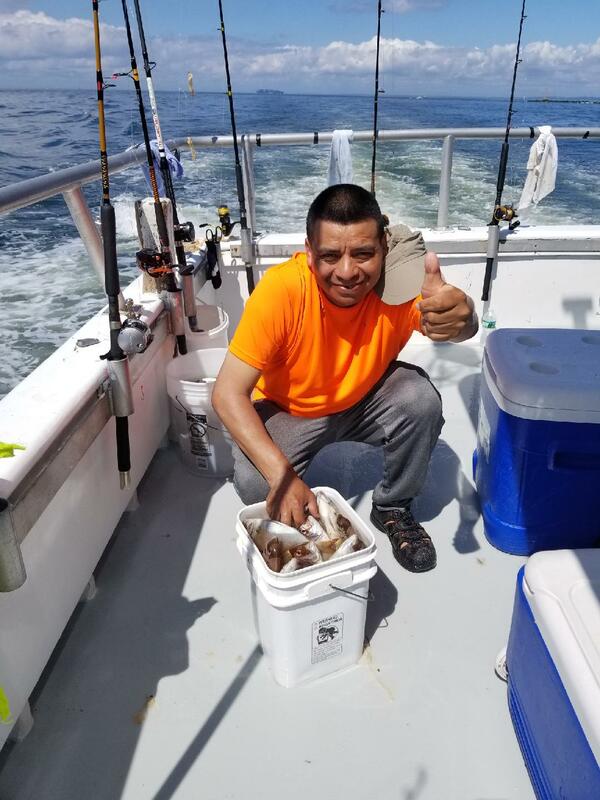 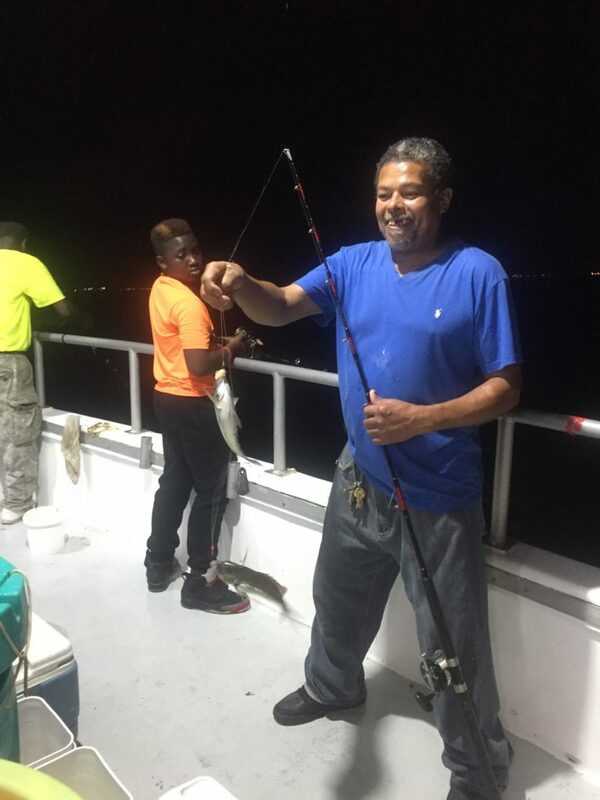 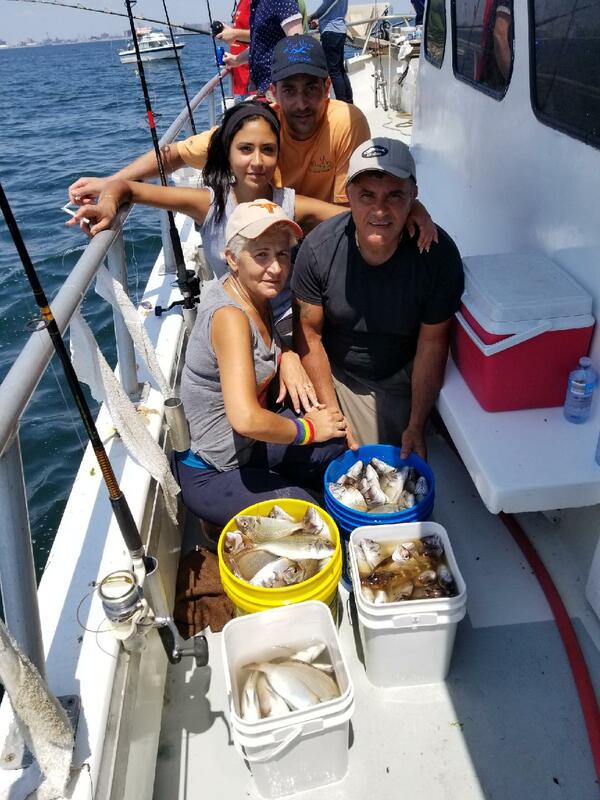 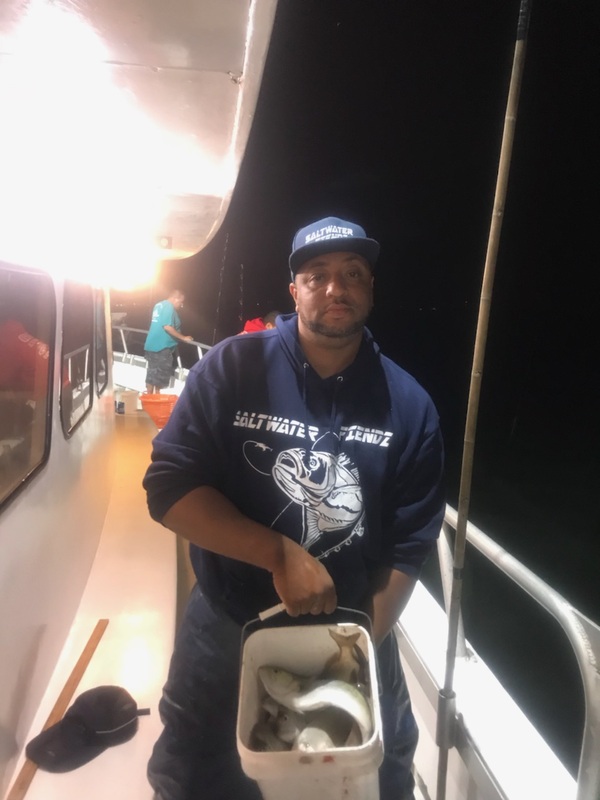 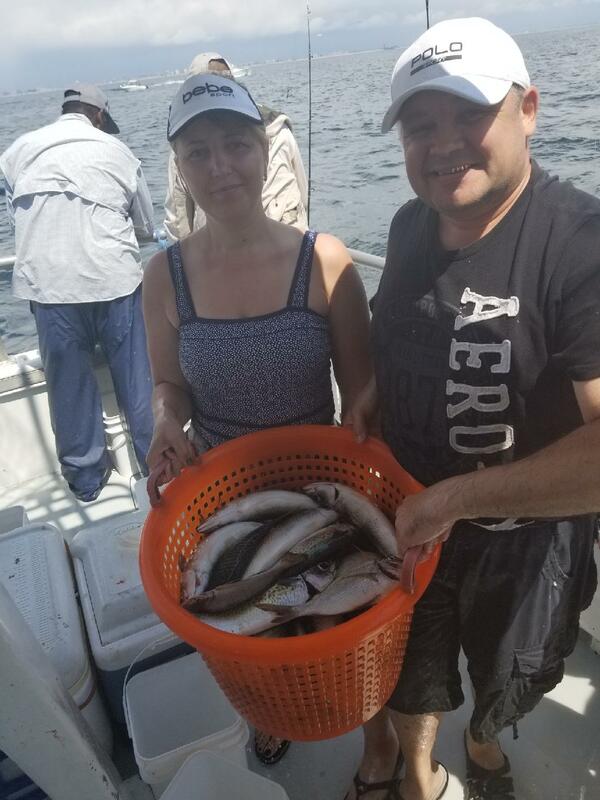 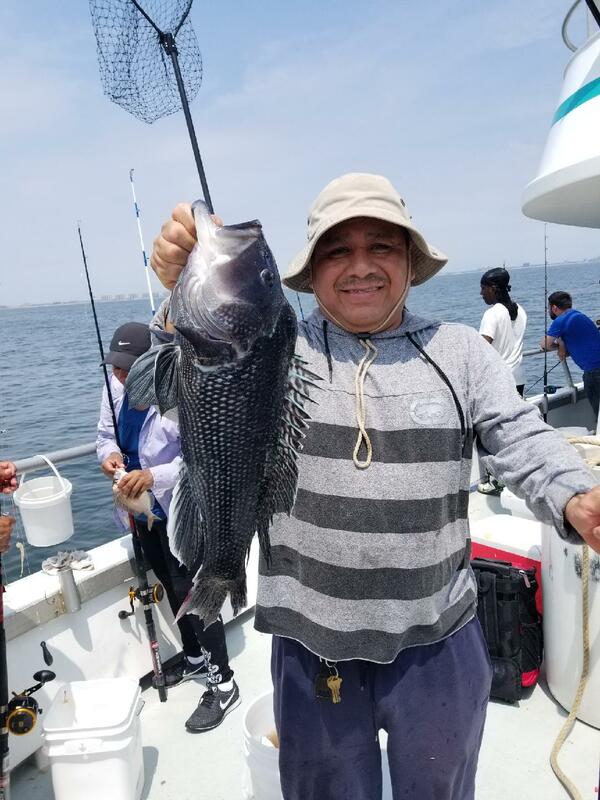 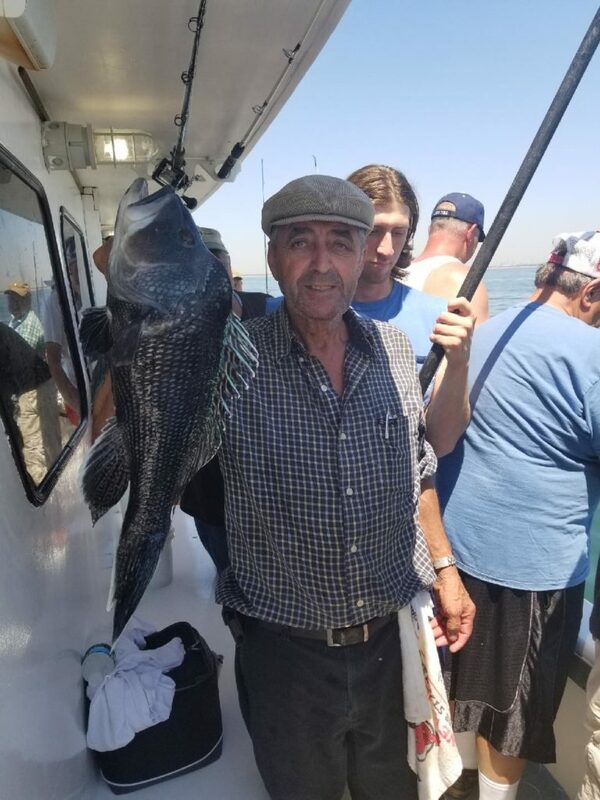 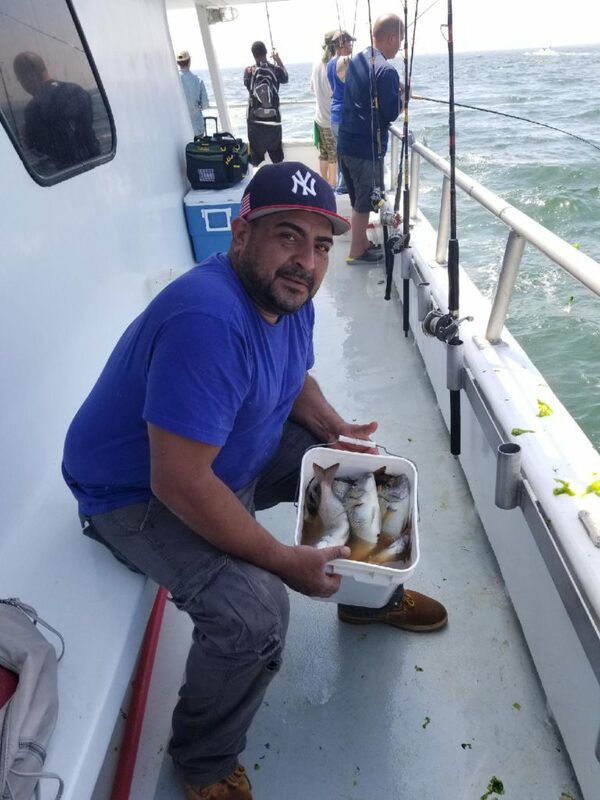 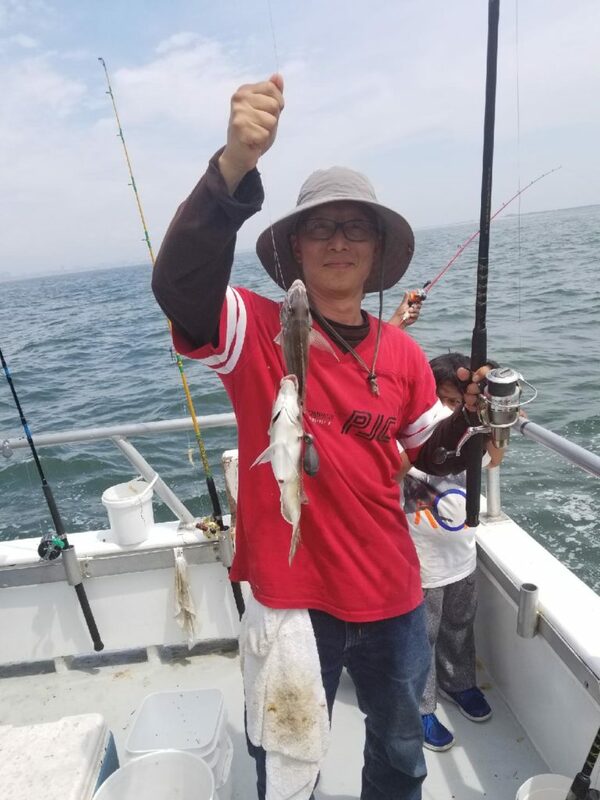 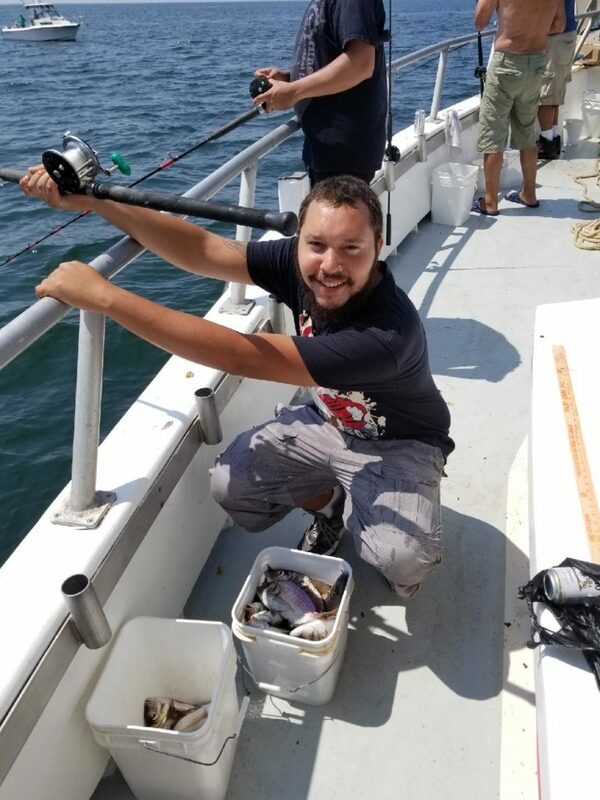 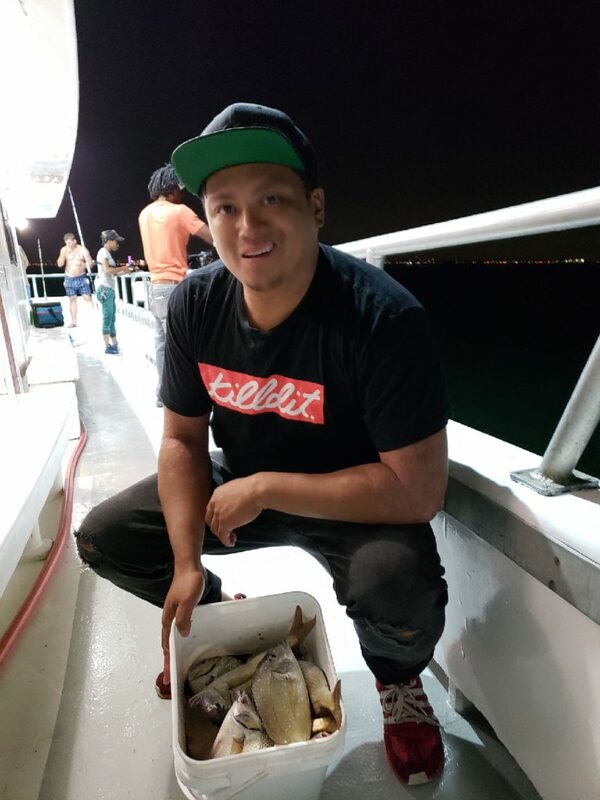 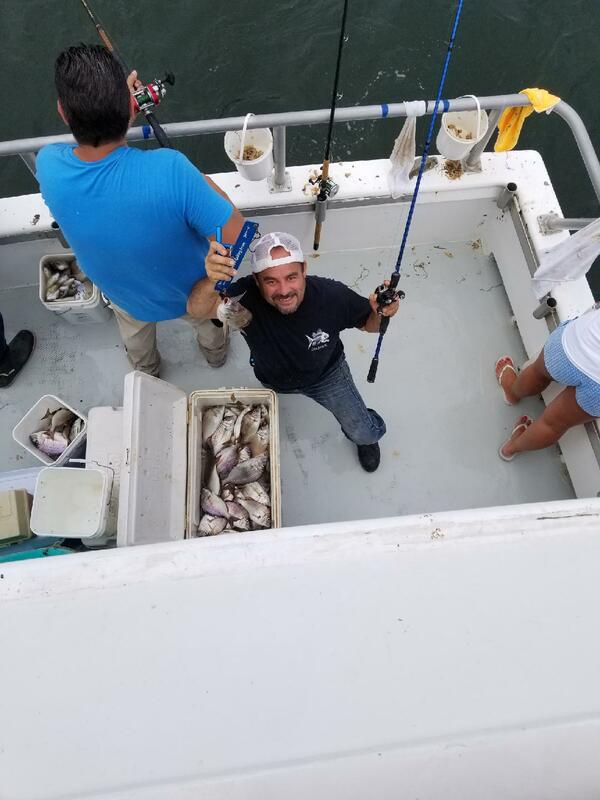 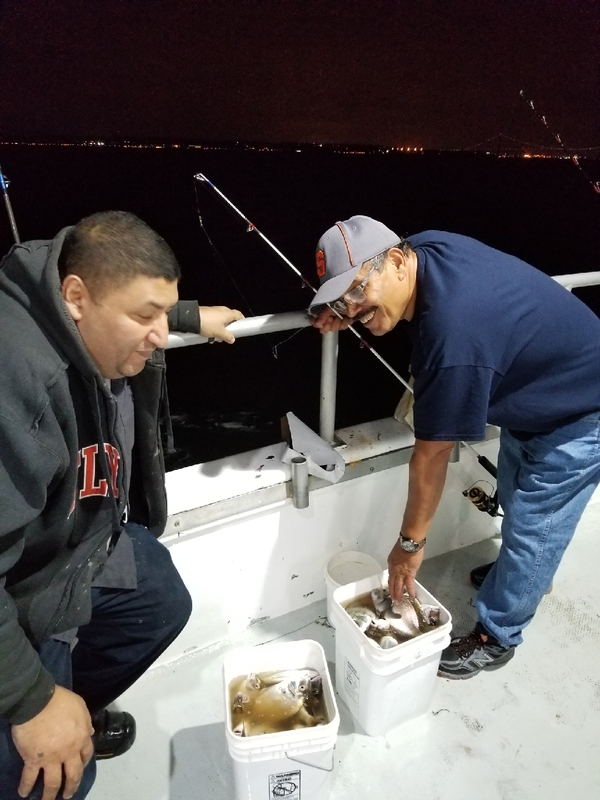 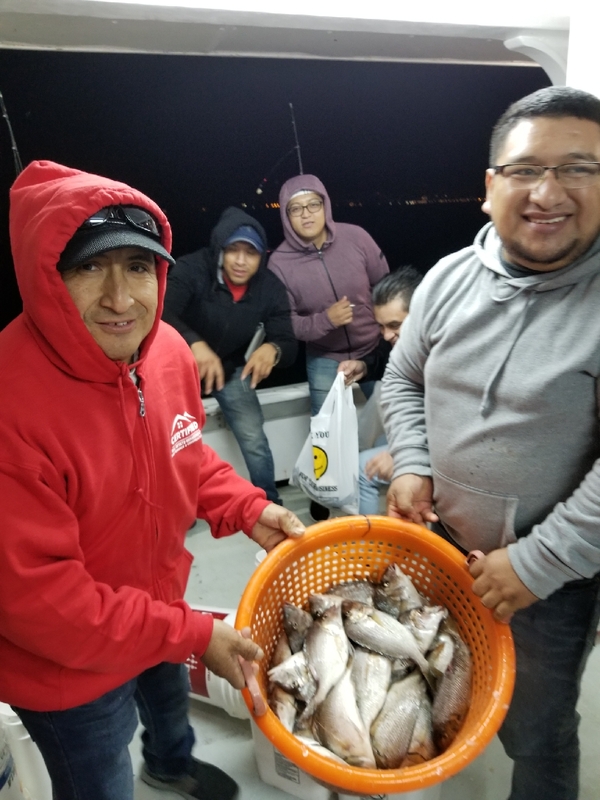 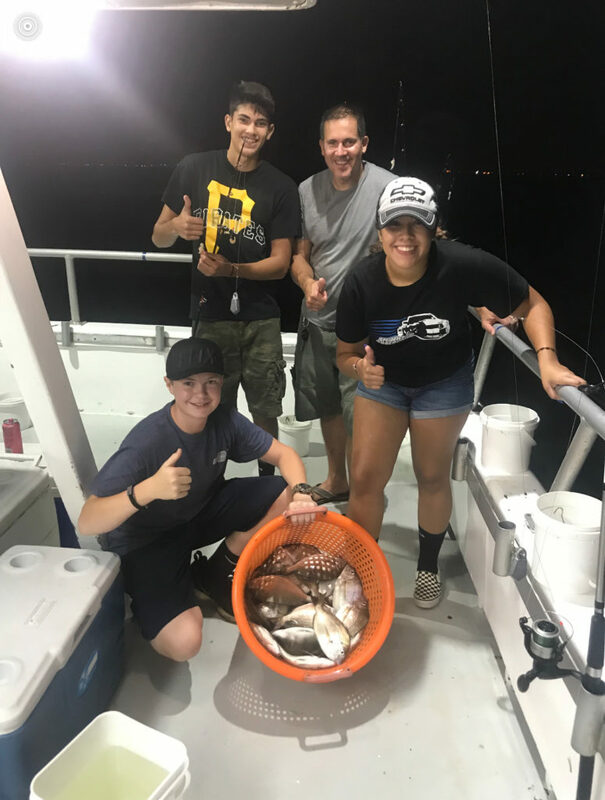 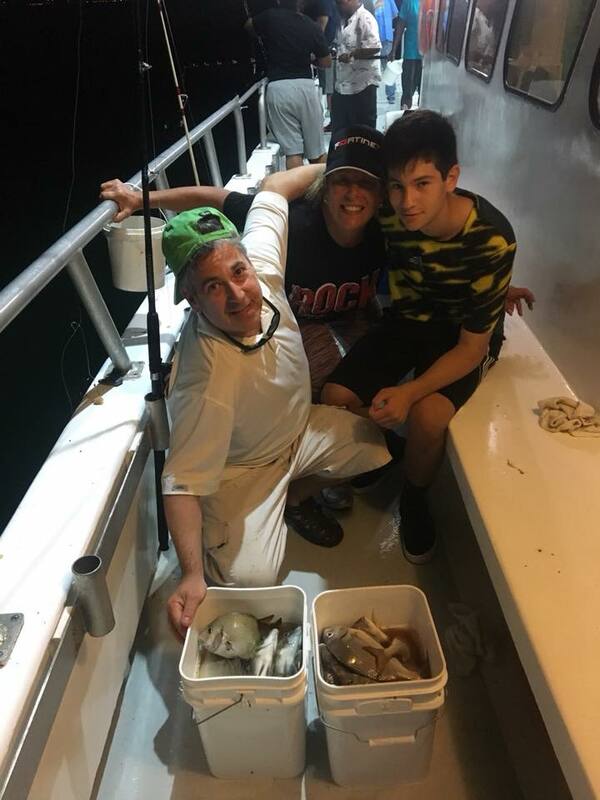 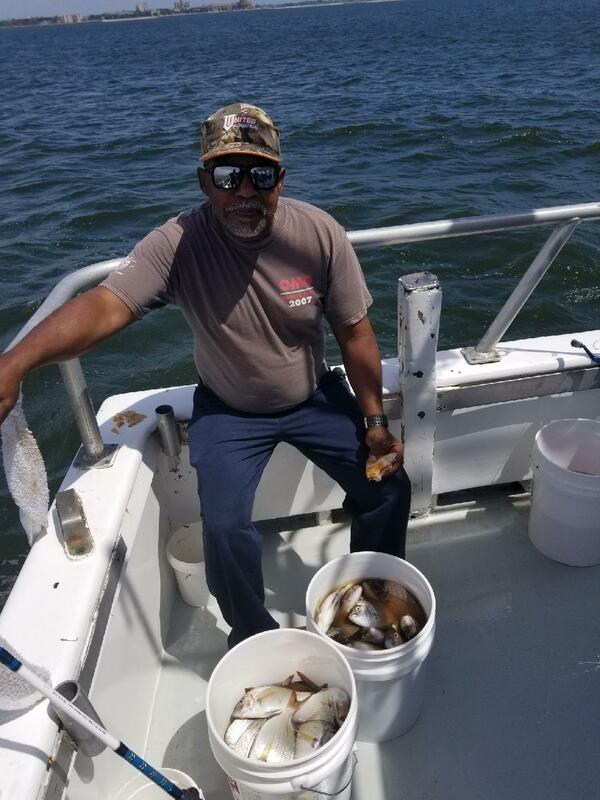 Come and join us day or night on our open boat fishing trips from Sheepshead Bay Brooklyn, NY and enjoy some great fishing in real nice comfortable weather. 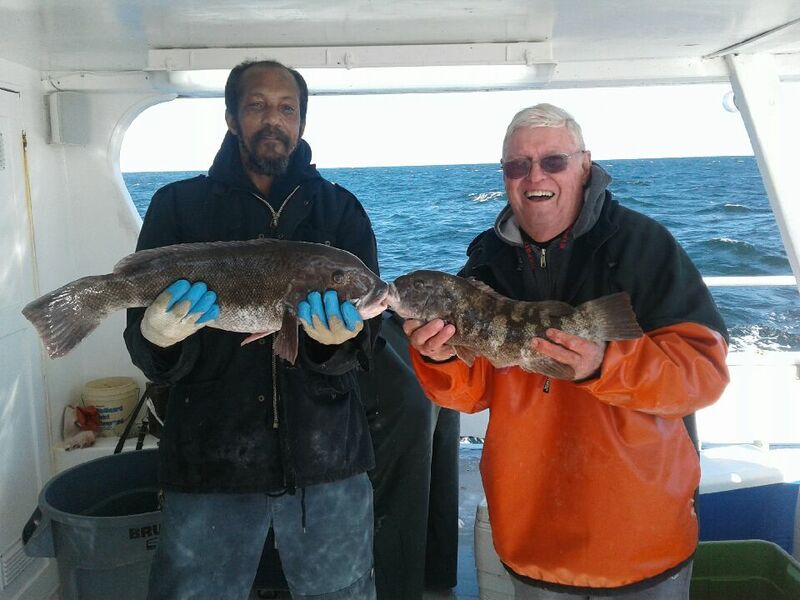 Or give us a call for a private charter 10-50 people. 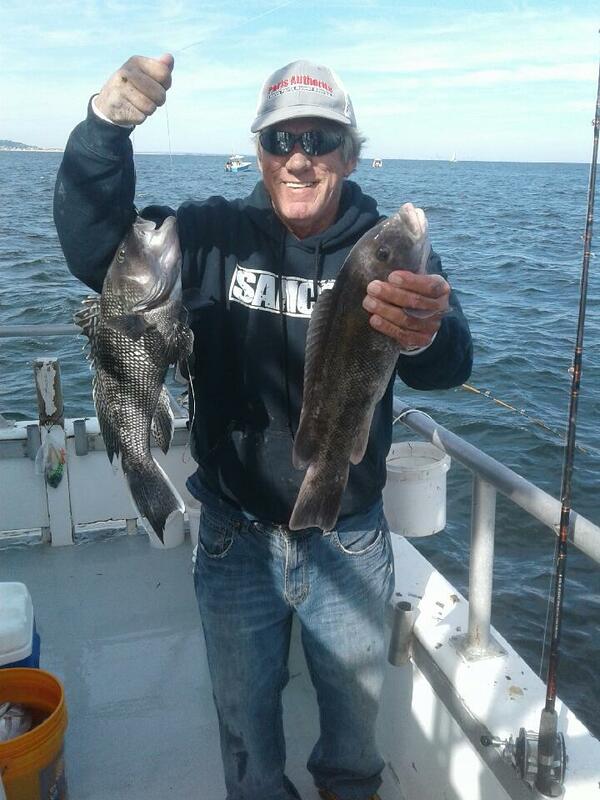 Great Fishing Limits of Porgy’s w Seabass Triggers Blues and Fluke Mixed In ! 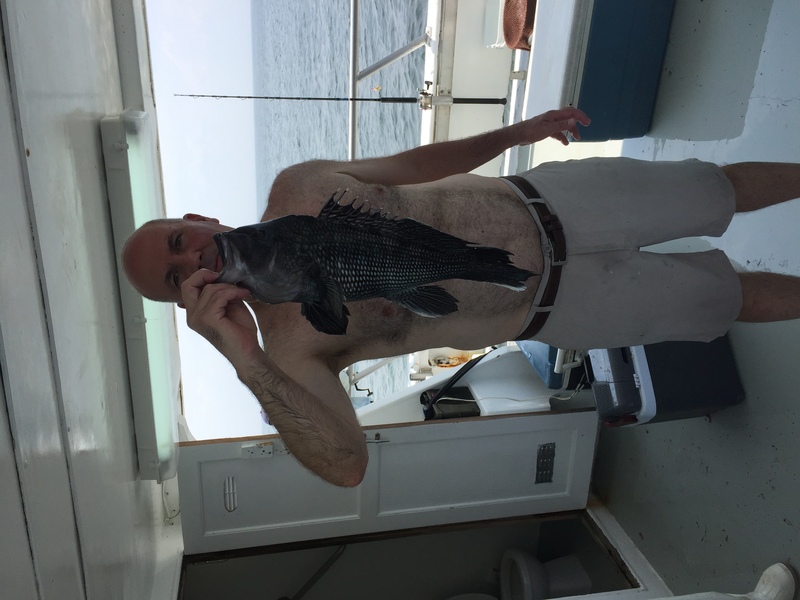 Here’s some photos of recent catches. 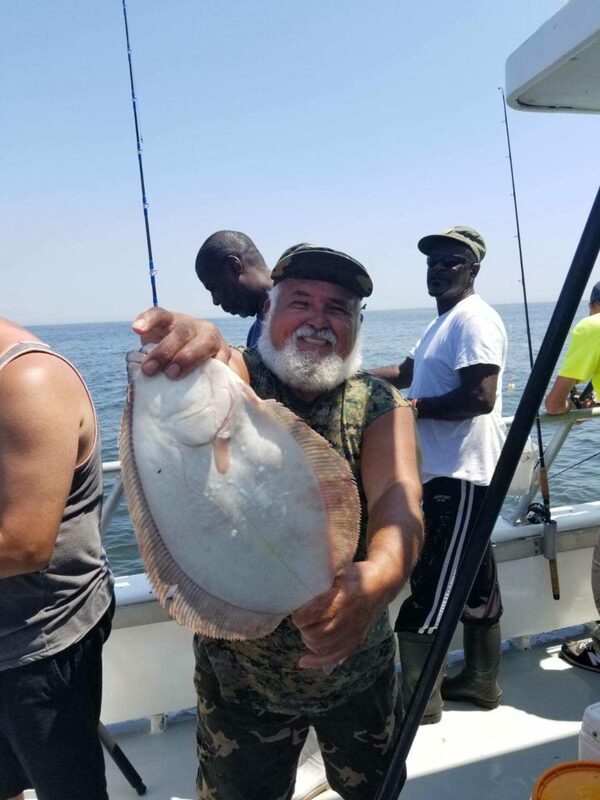 Many happy anglers on all trips lately. Weather is clear and Porgy’s are Biting ! 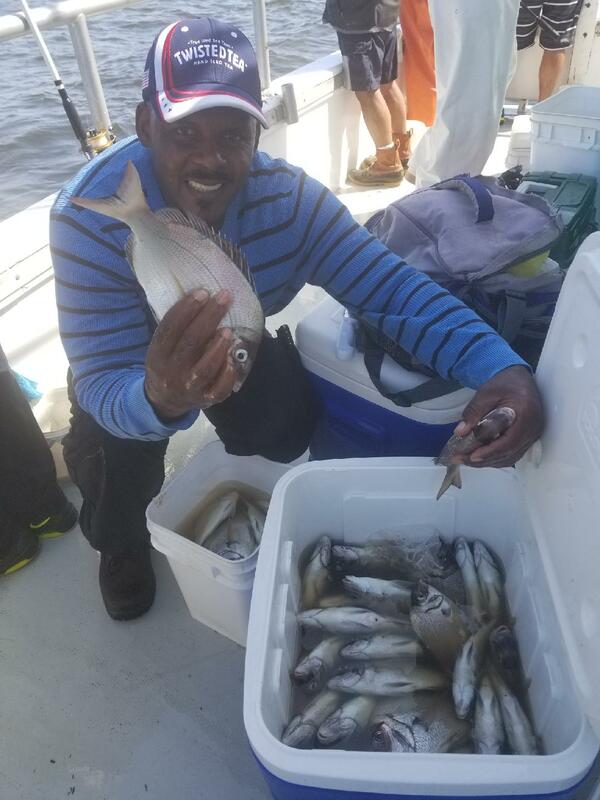 We have had a some nasty weather this week and missed a few trips but anytime we have been out in the day the Porgy fishing has been SUPER ! 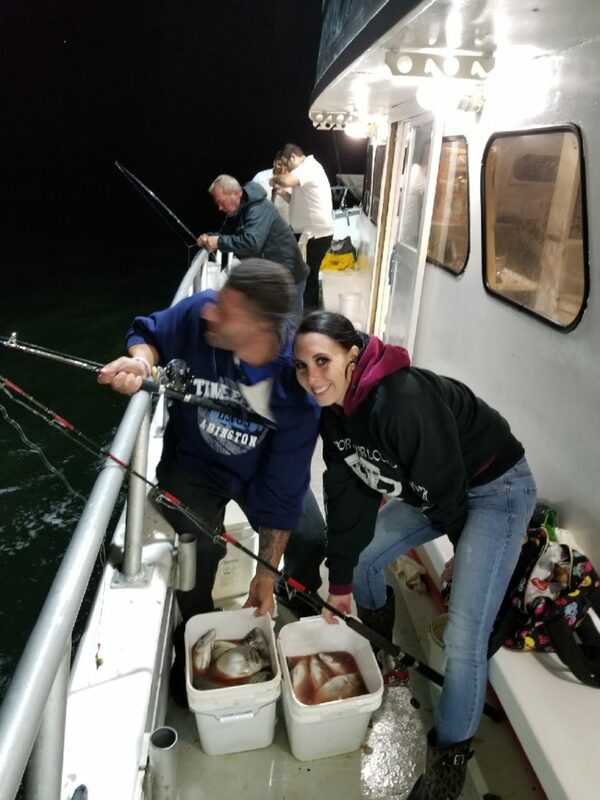 Here’s some pics from the last couple of trips and weather looks great for this weekend. 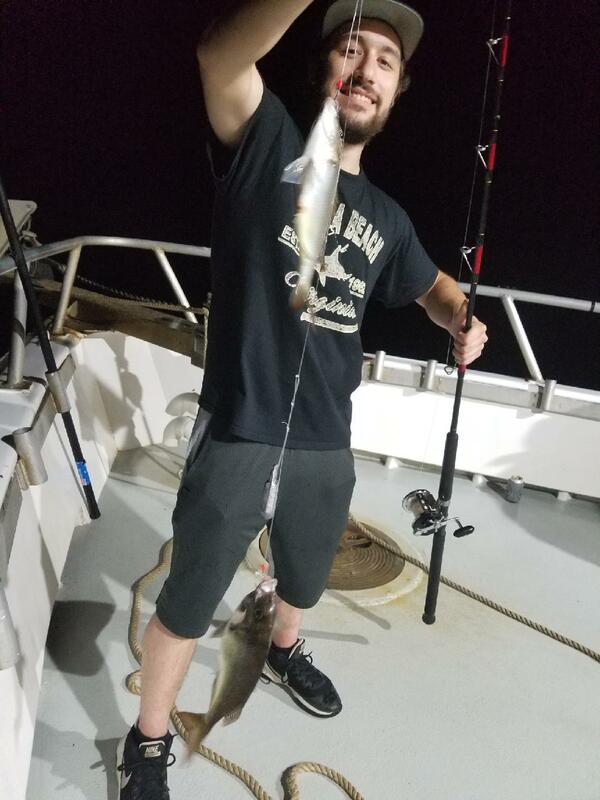 Fishing Is HOT Day And Night ! 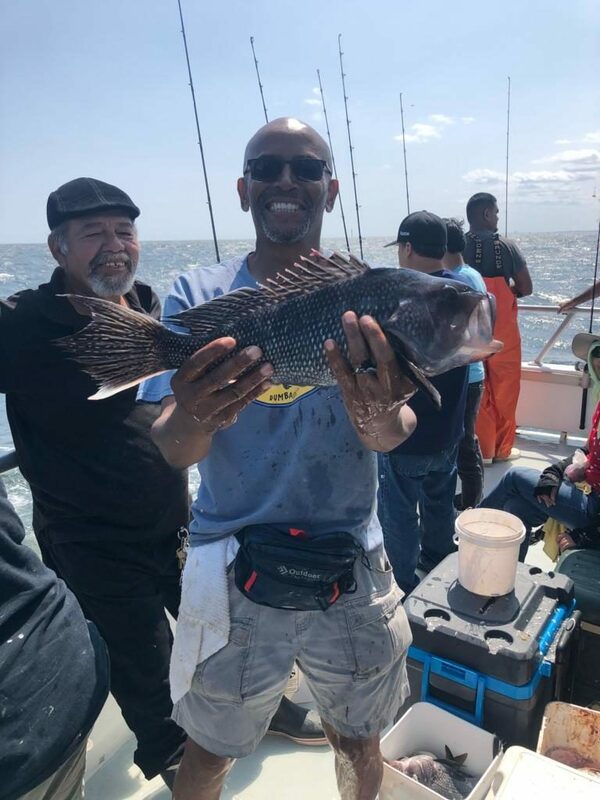 Porgy fishing only seems to get better. 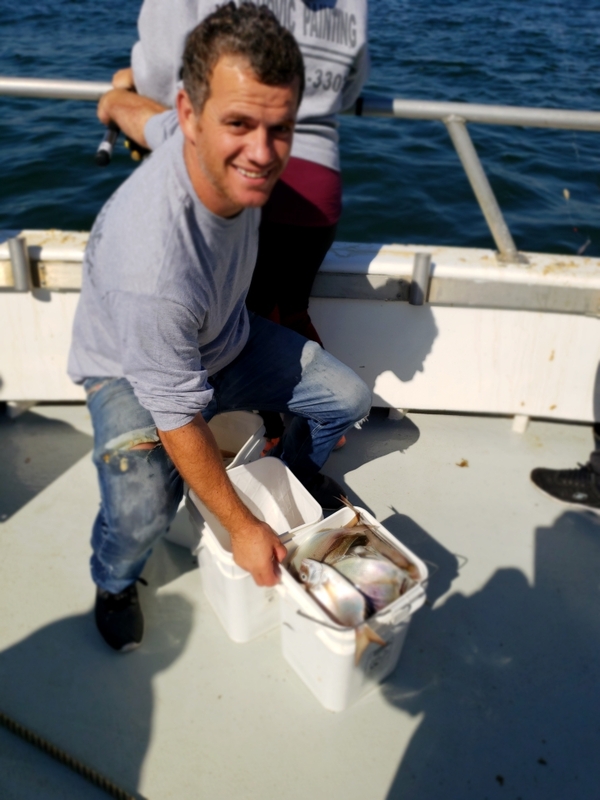 Day n Night we are filling buckets and coolers with tasty Scup, Seabass and Triggerfish. 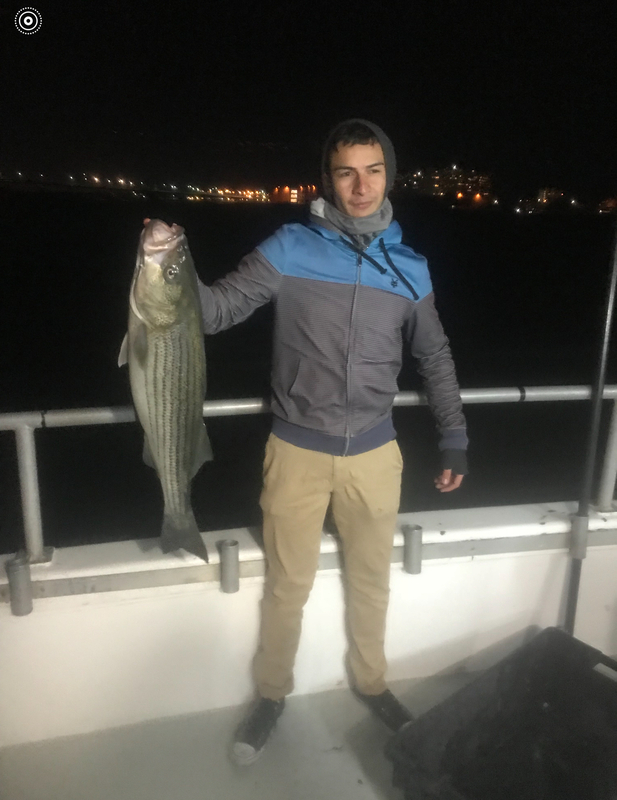 Even nailed a nice Striper the other day. 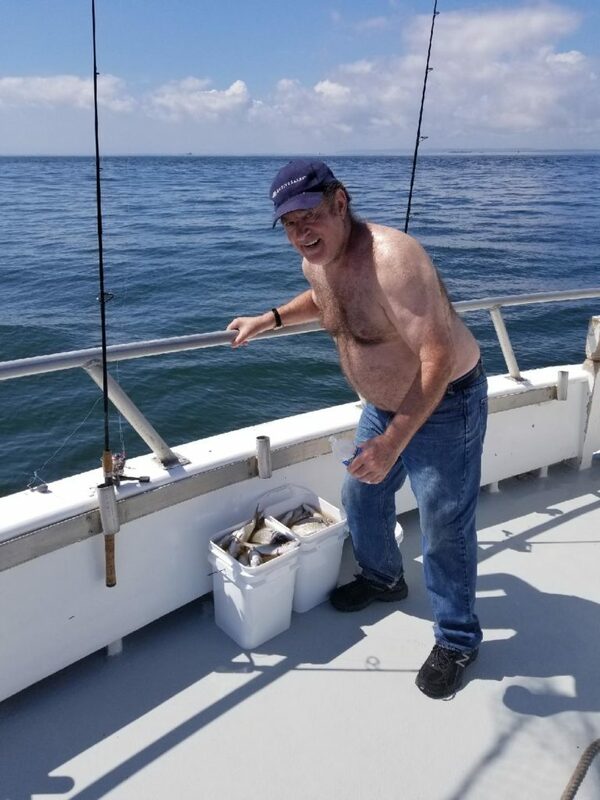 Come on down before summer passes you by, we sail everyday and night. 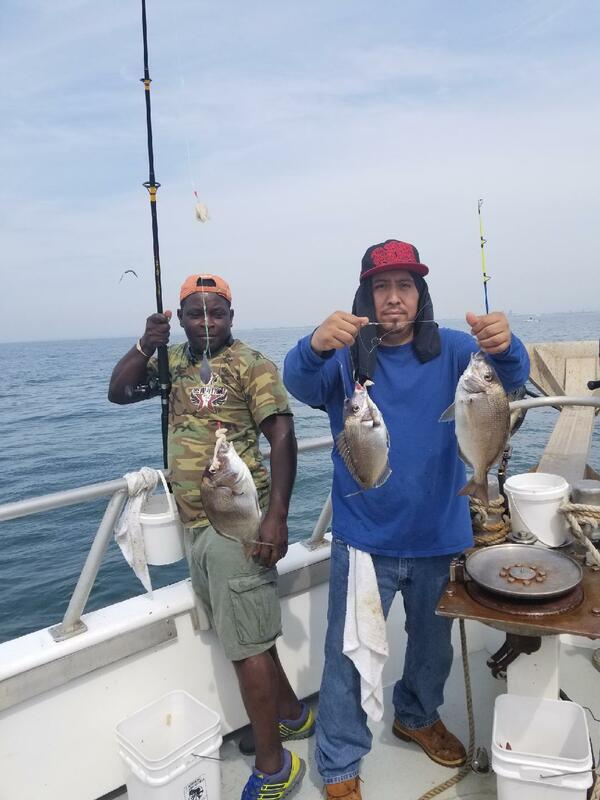 LIMITS of Porgy’s with Seabass n Triggers Day n Night ! 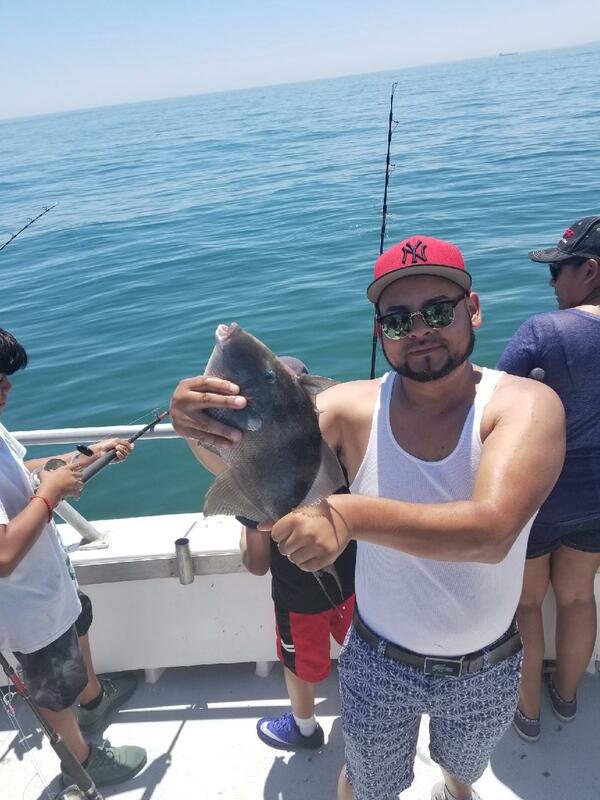 Fishing is GREAT and the weather has been even better. 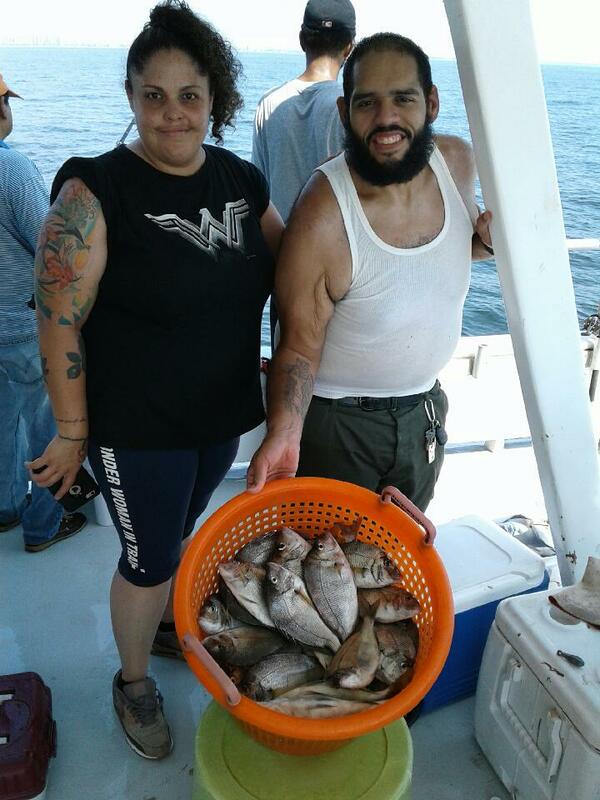 Day and Night trips have both been action packed with tons of Porgy’s plus some Seabass and Triggerfish mixed in ! 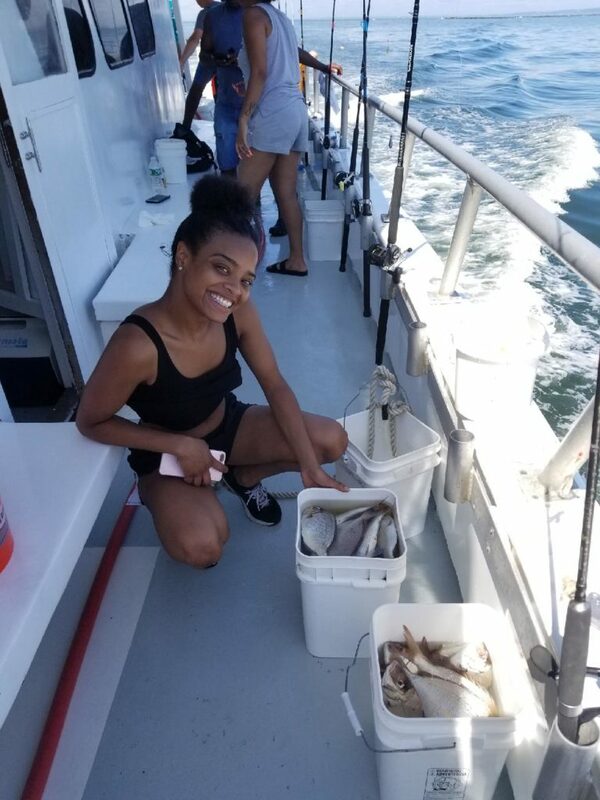 The MARILYN JEAN IV sails EVERYDAY 7am to 3pm ($60) and 7pm to 12 midnight ($50). 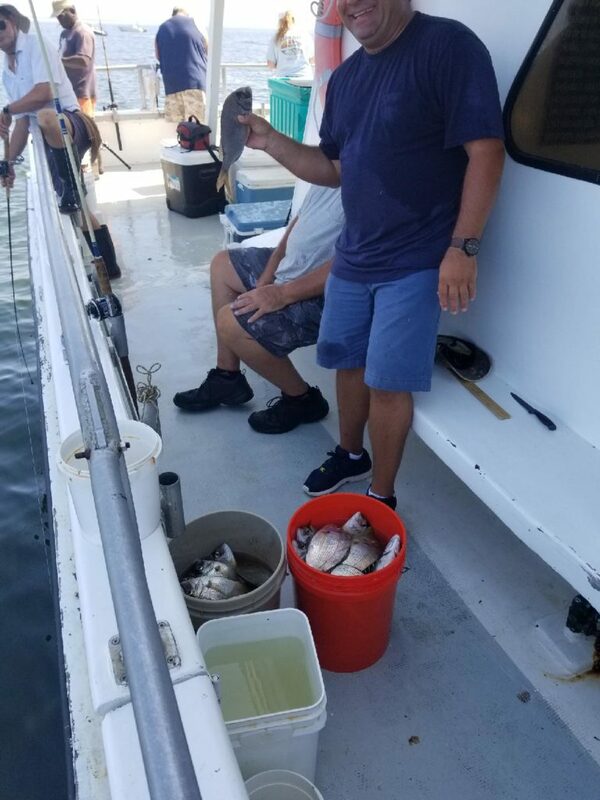 LIMITING OUT ON PORGY’S PLUS JUMBO SEABASS AND TRIGGERS ! 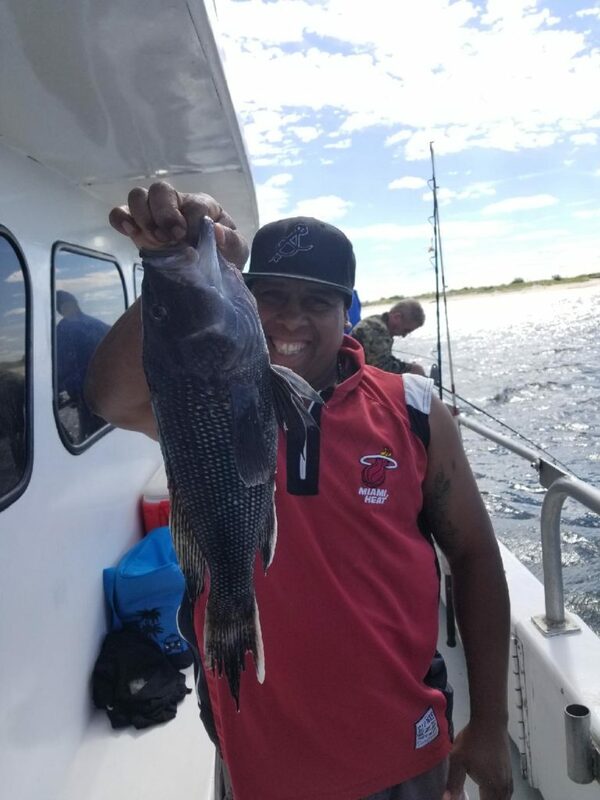 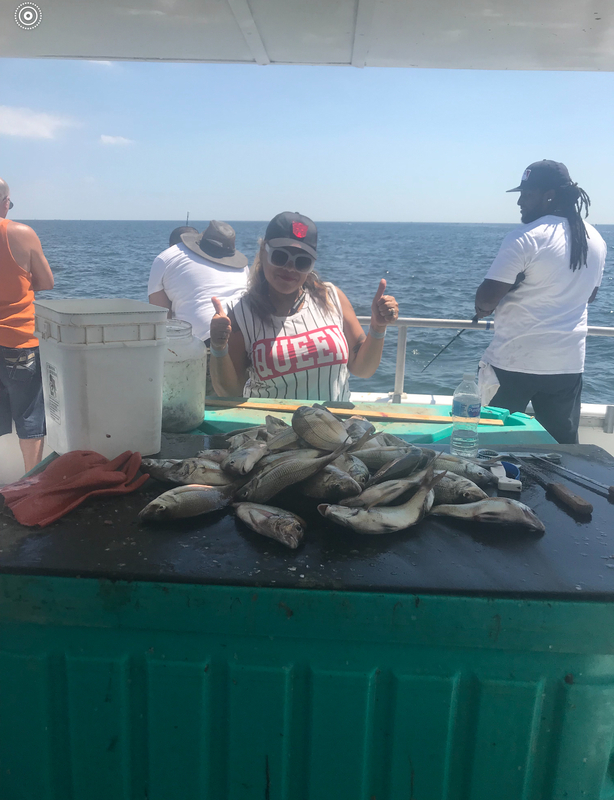 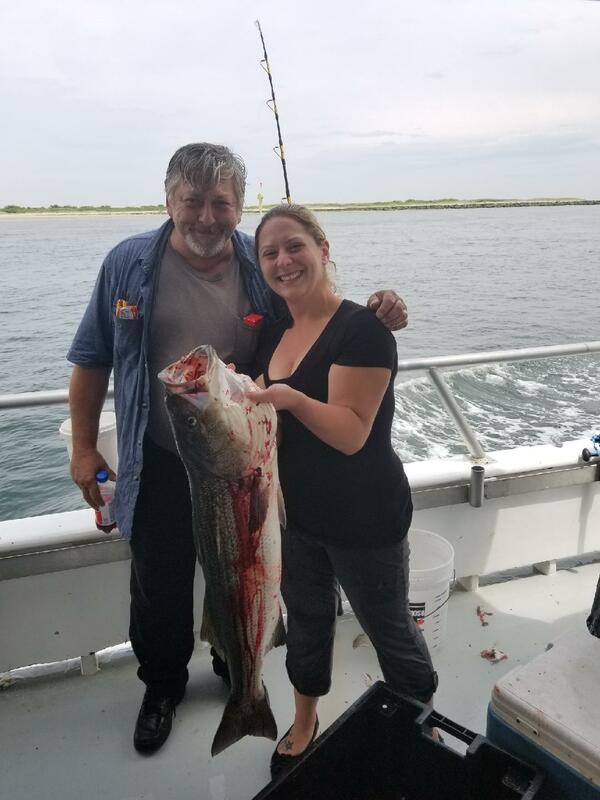 The Marilyn Jean IV and Capt’s Lady have been limiting out on nice Porgy’s and now some large Seabass and Triggerfish are in the mix. 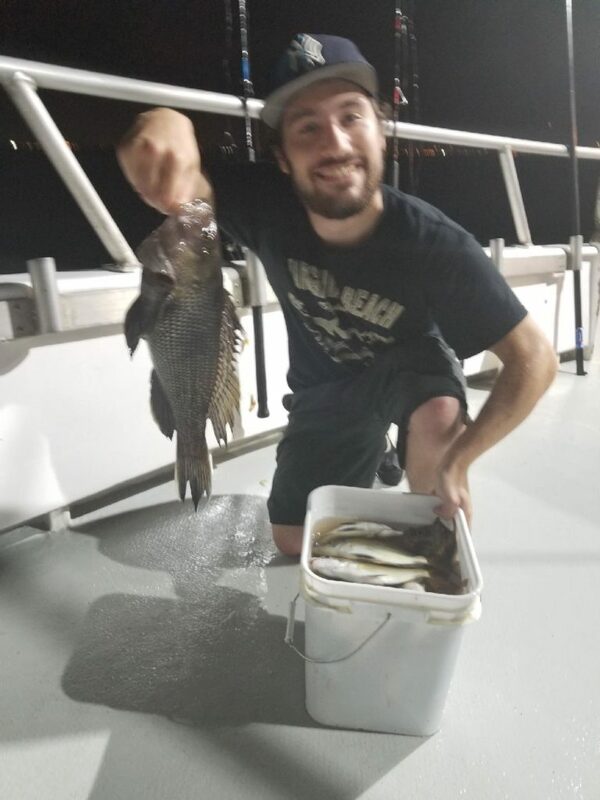 Both day and night trips are equally productive. 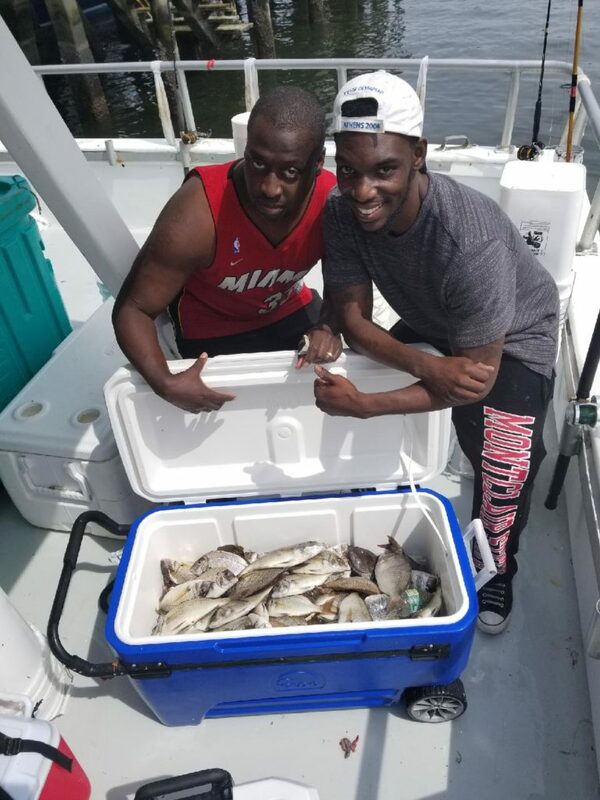 Now is the time to fill your coolers, book any trip online to guarantee your spot. 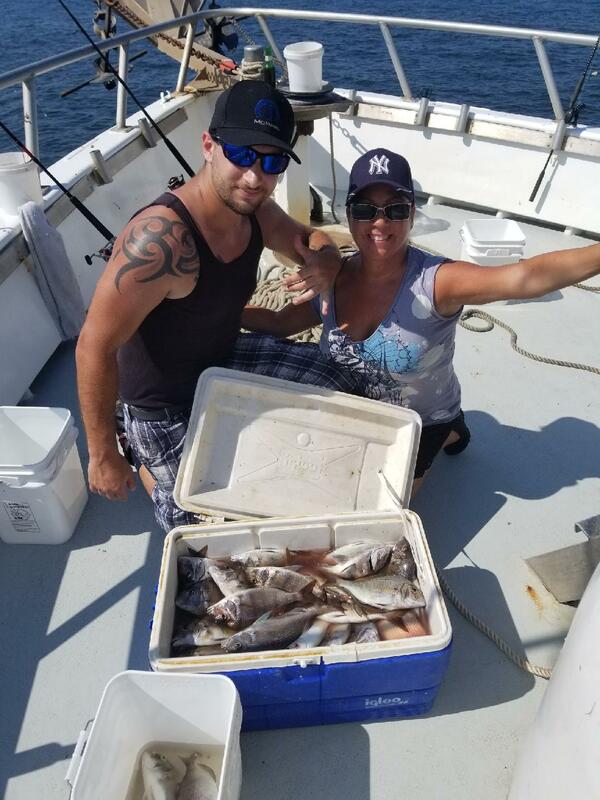 Private fishing charters and group discounts are available for groups of 20+ people. 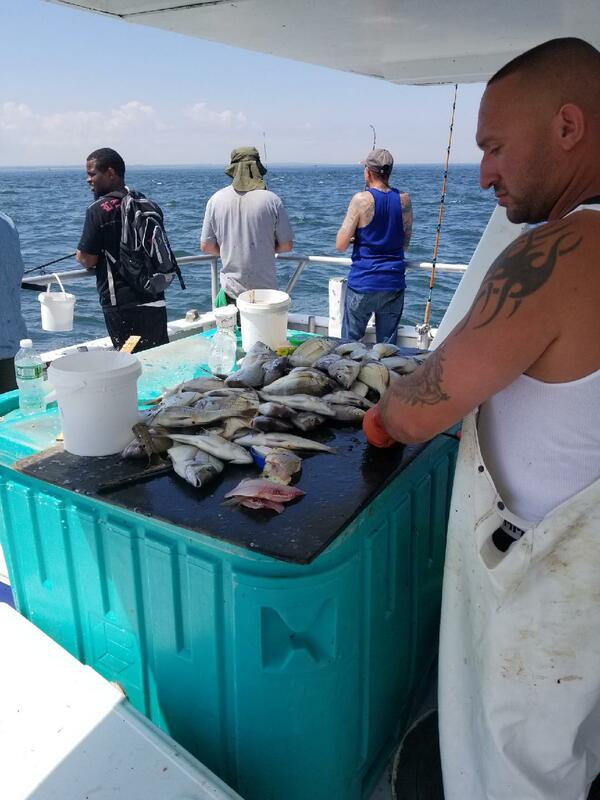 Give us a call 917-650-3212 0r 917-560-8224. 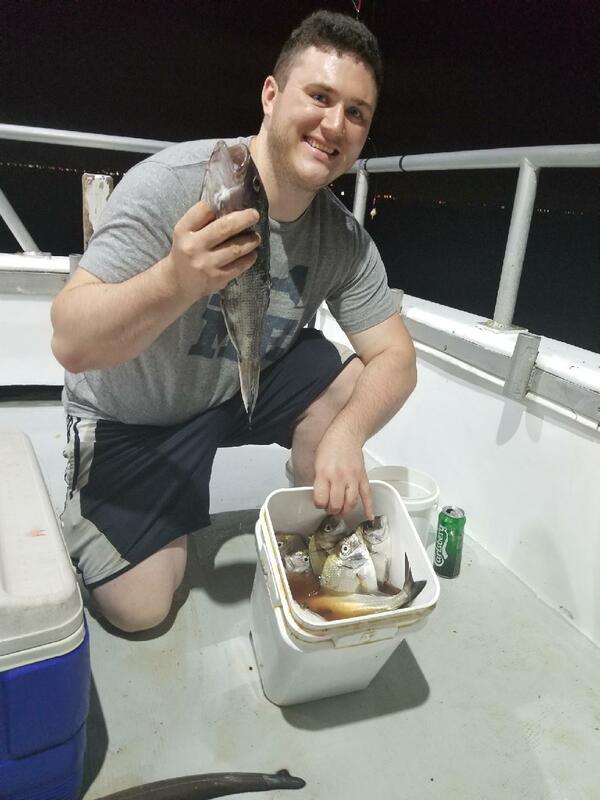 Here are some recent pics.